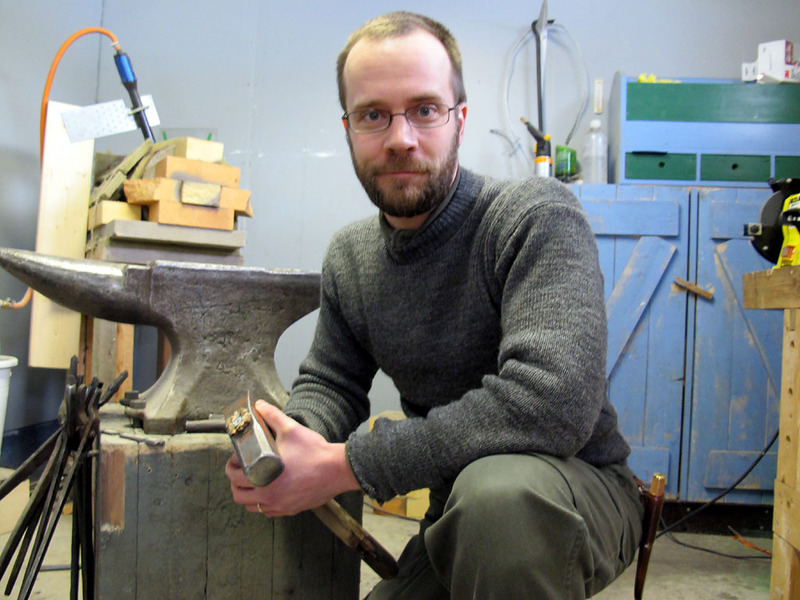 I have recently been corresponding with Saku Honkilahti, a friend and contributor to this blog since the beginning. 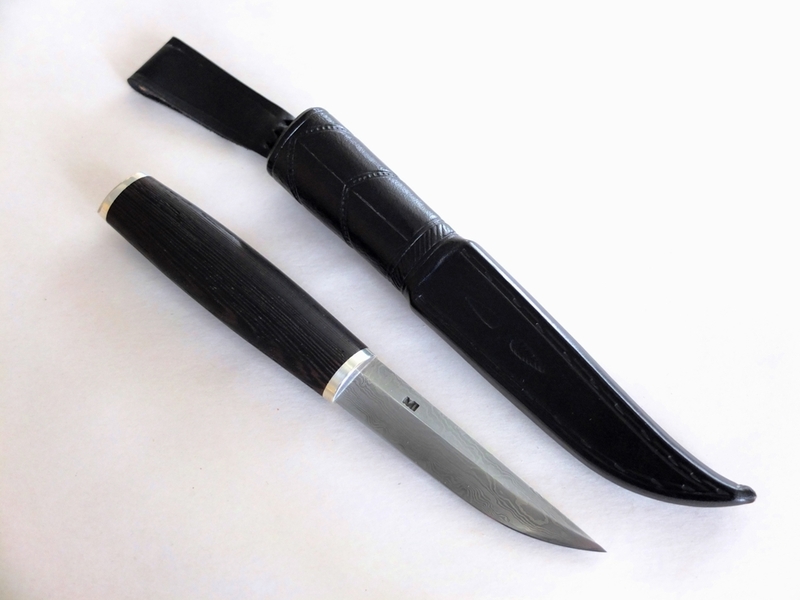 Saku has provided information that I needed for several posts, not only is he knowledgeable but he makes a very fine puukko. 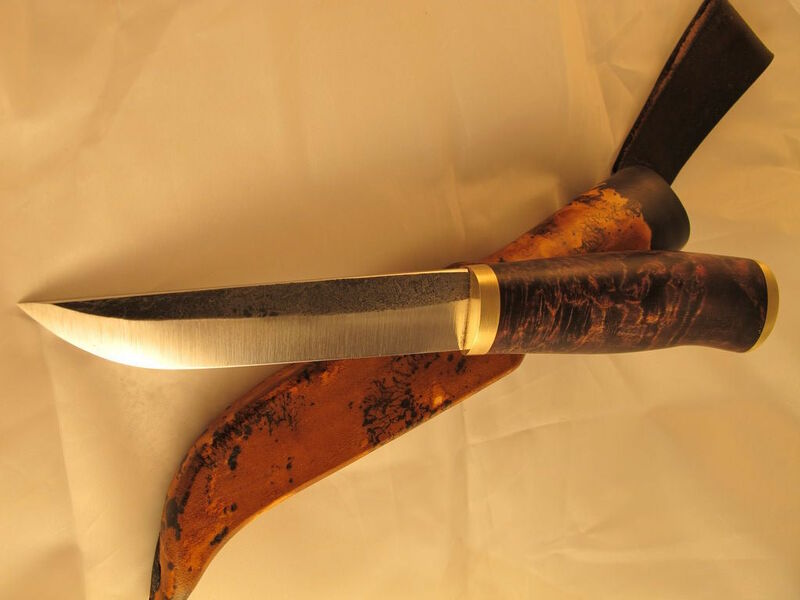 I am pleased to own one that he made for me several years ago. 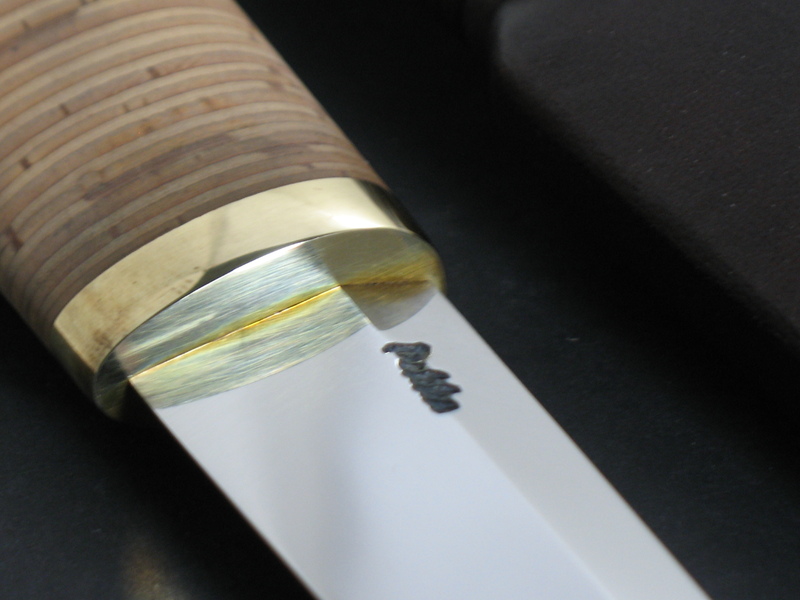 I asked Saku to write down his thoughts on knife making for this post and here is what he had to say. 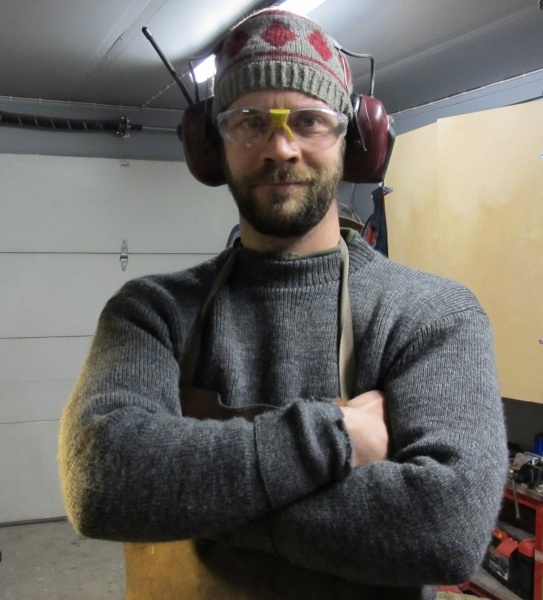 “I have been making puukkos for over a decade. In that time I have slowly developed my own style. 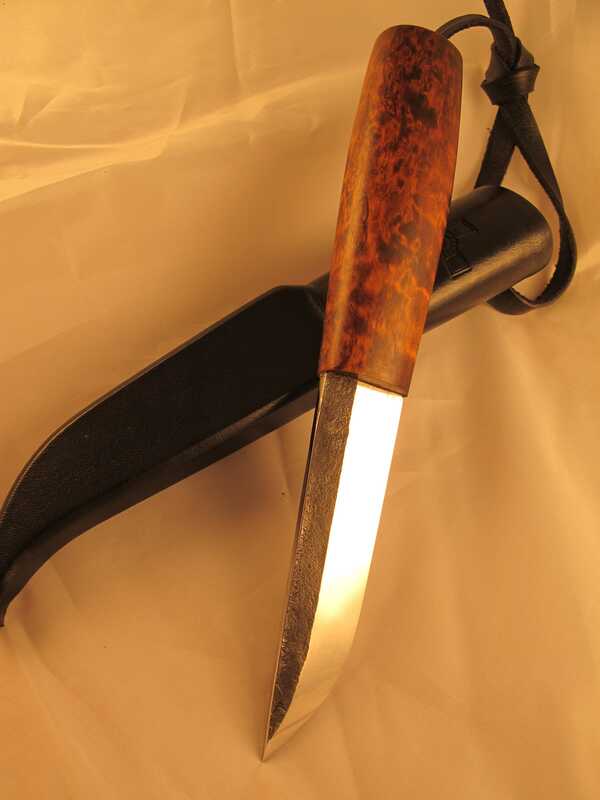 Number one is SH-stamped hammer finished hand forged blade. 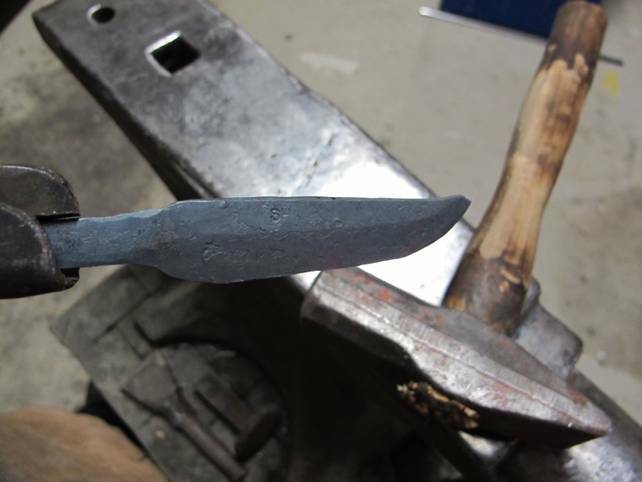 I have a very efficient grinder and a very good steel source but almost stubbornly I want to hand forge all my blades. 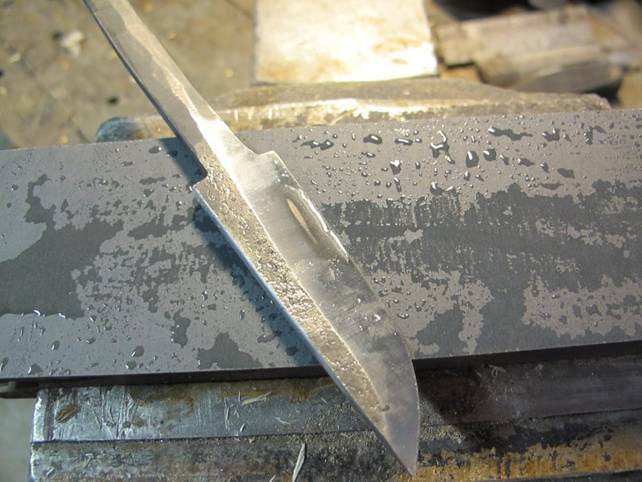 Of course there are many theoretical writings that say modern steels don`t need forging. 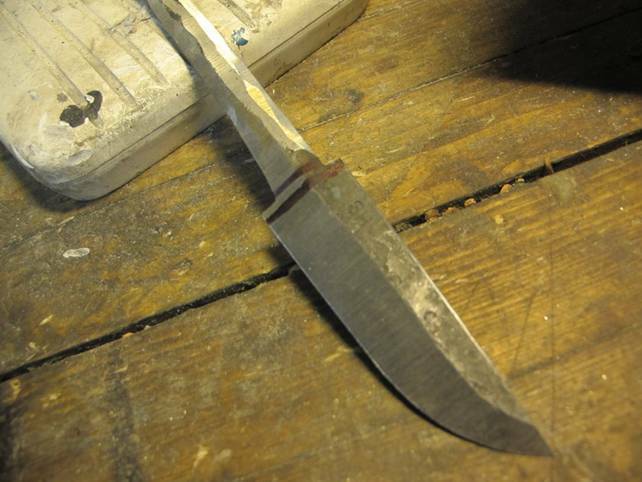 Maybe true, but for me it is an important part of knifemaking. 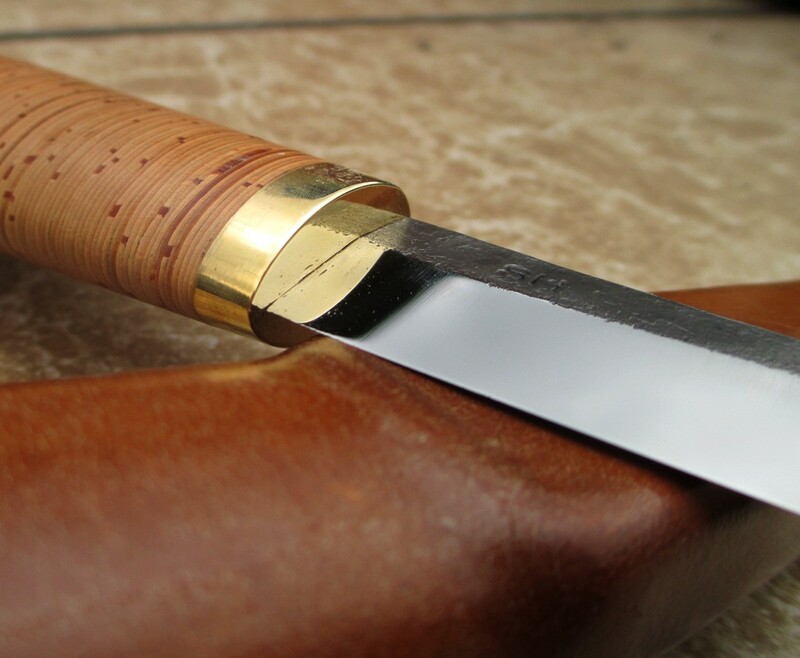 And I want that it can be seen, so my blades are hammer finished. 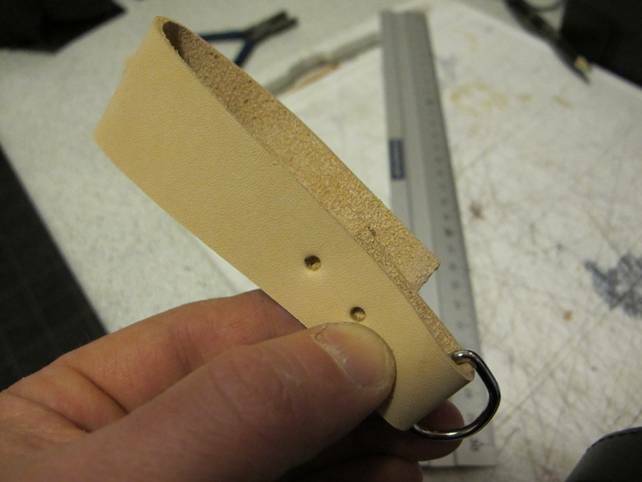 My second trade mark is simple materials. 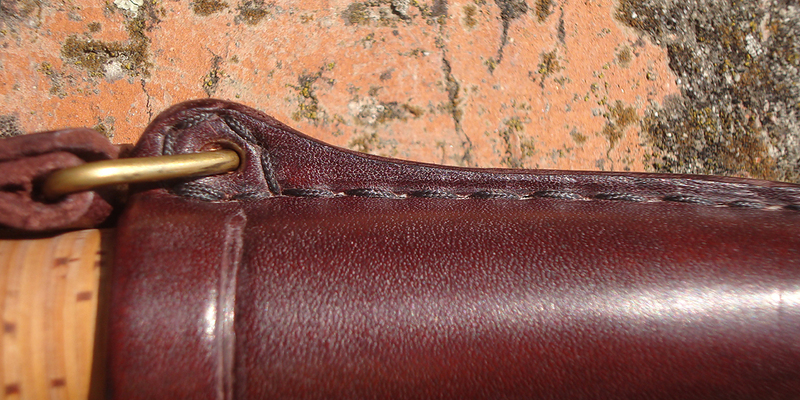 Materials that look and feel genuine. 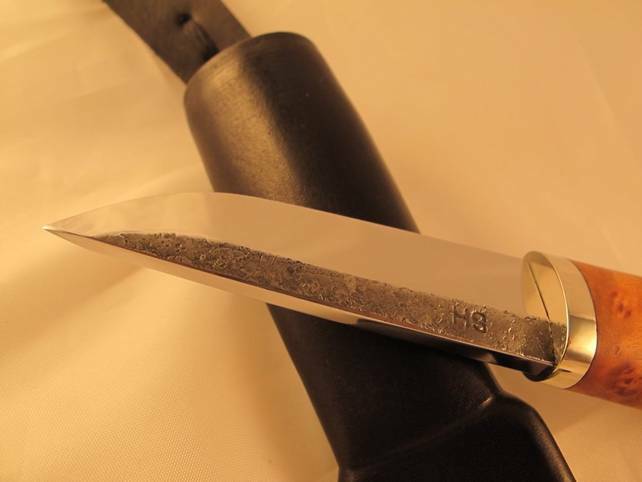 I use basic carbon steel, 80CrV2 is my favorite blade material. 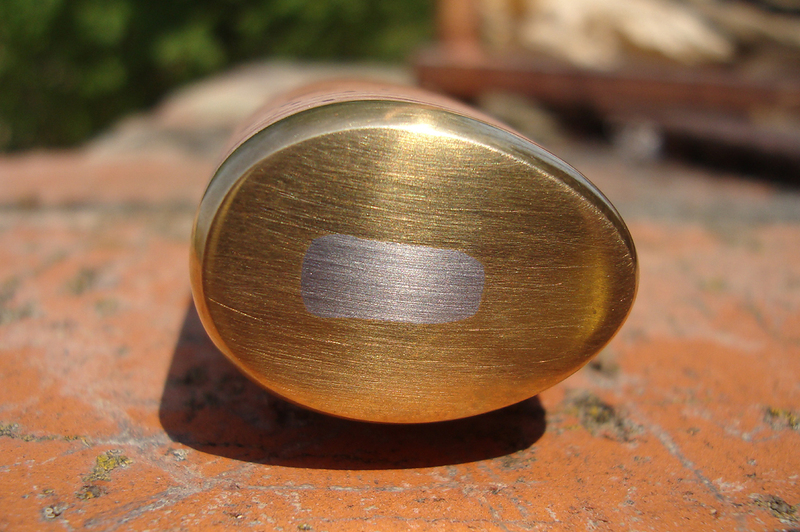 For bolsters I like to use brass, bronze or nickel silver. 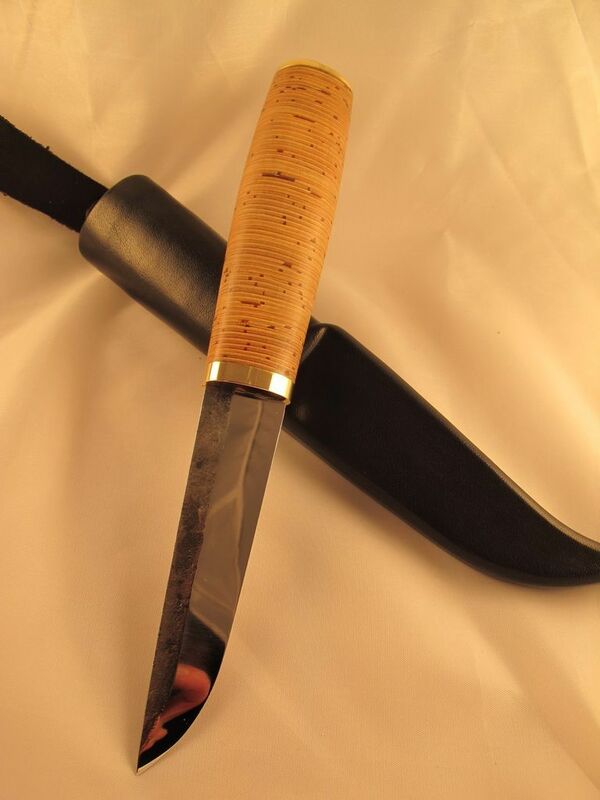 And for handles birch bark and curly birch are my two favorites. 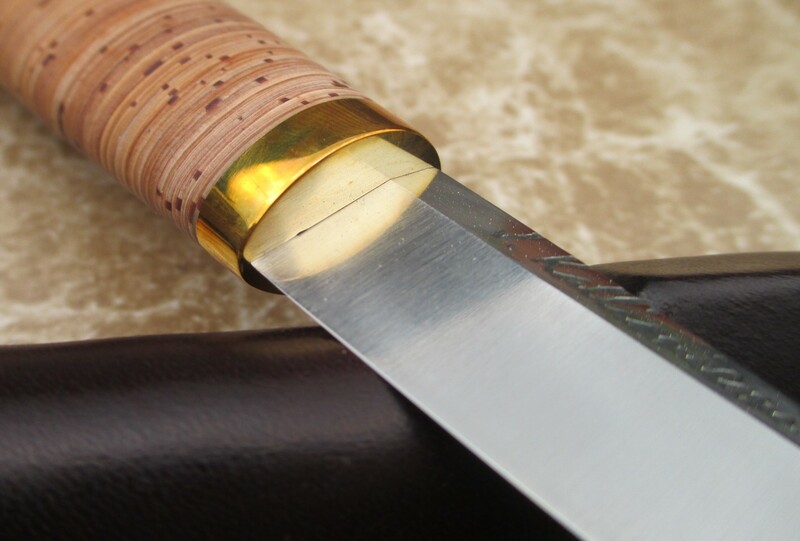 I have done some handles from micarta and other industrial materials too, but they just don’t feel right. 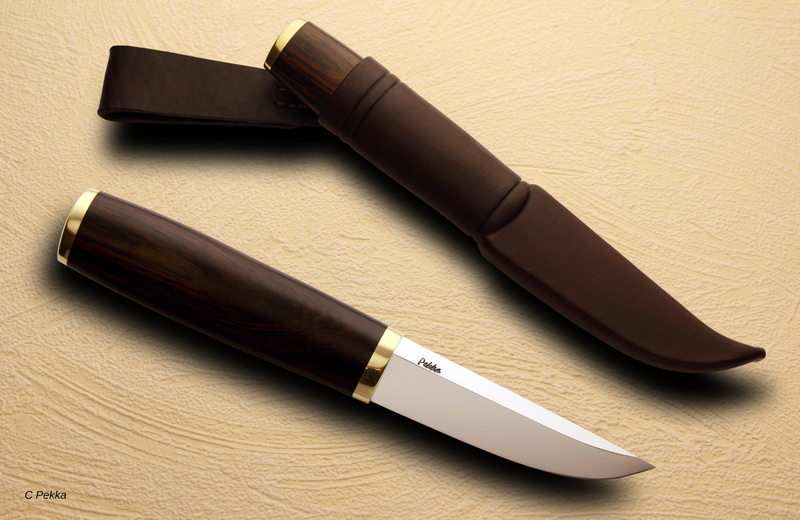 I must admit, stabilized woods are here and maybe, just maybe, there is something nice and easy in them. 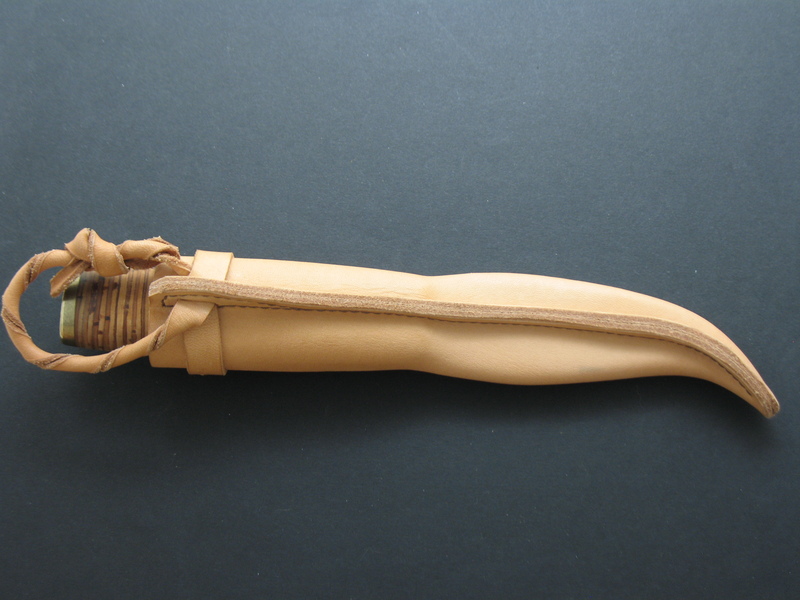 The third trademark in my puukkos are simple and strong lines. 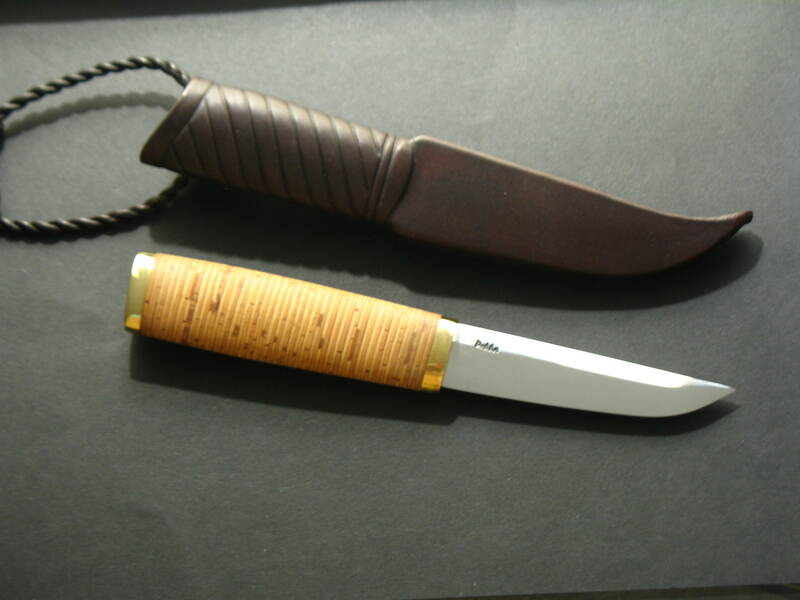 It must look like a puukko and it must feel like a puukko in hand. 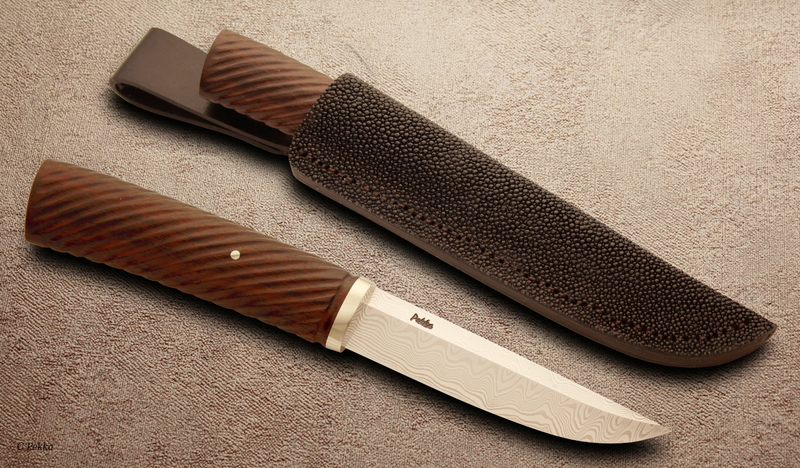 Even when it is dark at night, the handle shape tells you every time where the blade is. 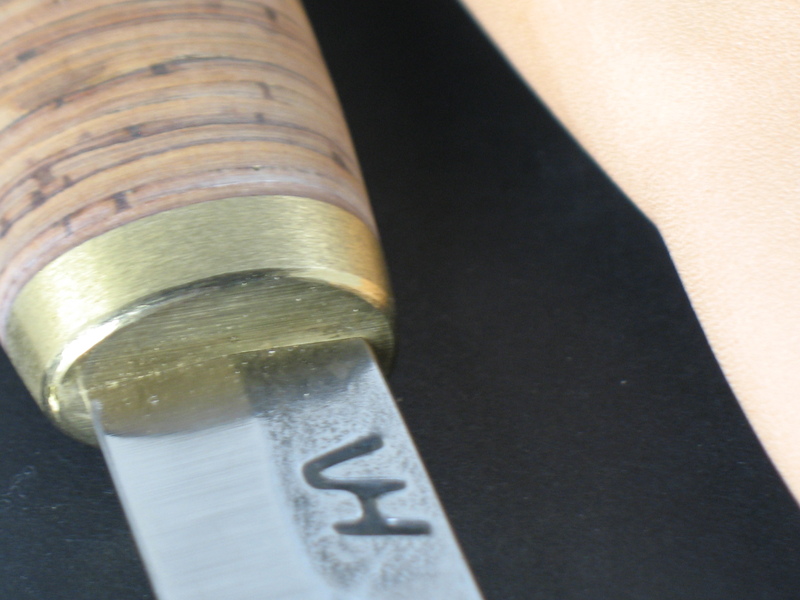 You can use about ten different holds on puukko and good handle must enable all them. 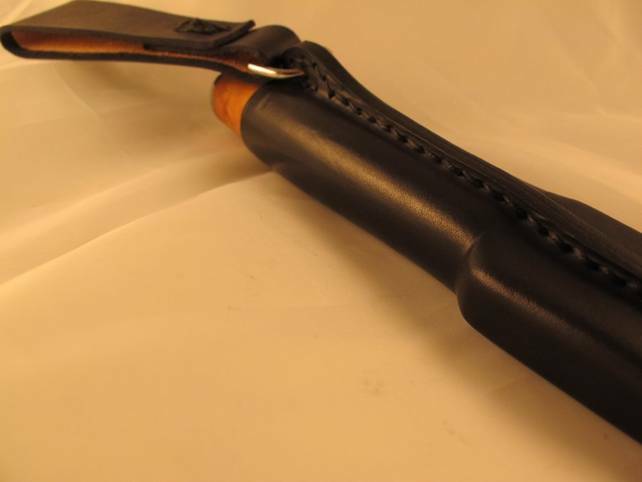 If there is some finger guard, holes or too much sharp curves, you can´t take all these ten holds. And it must feel strong, powerful, but not too burly or cumbersome. 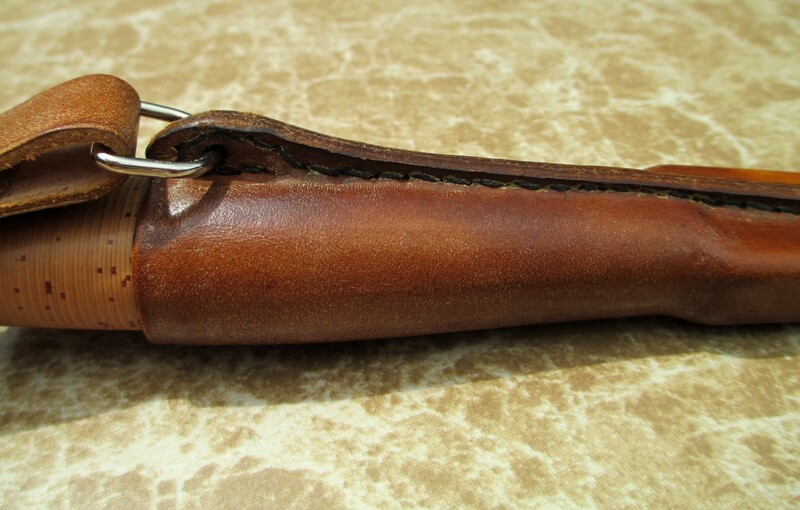 Fourth is a simple leather sheath with a two sided wooden insert, the lesta. 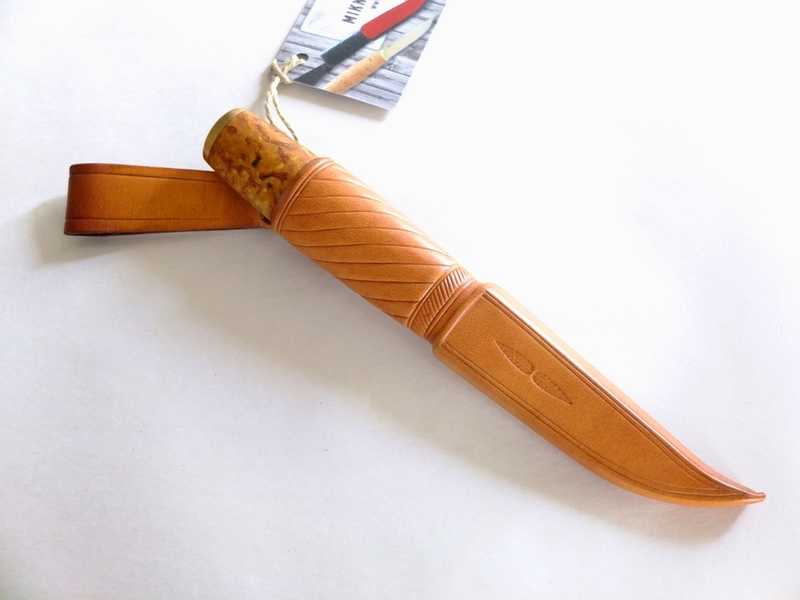 The puukko must stay in the sheath when you sit, run or even do a hand stand.That is why I handsew my sheaths from wet vegetable tanned leather. 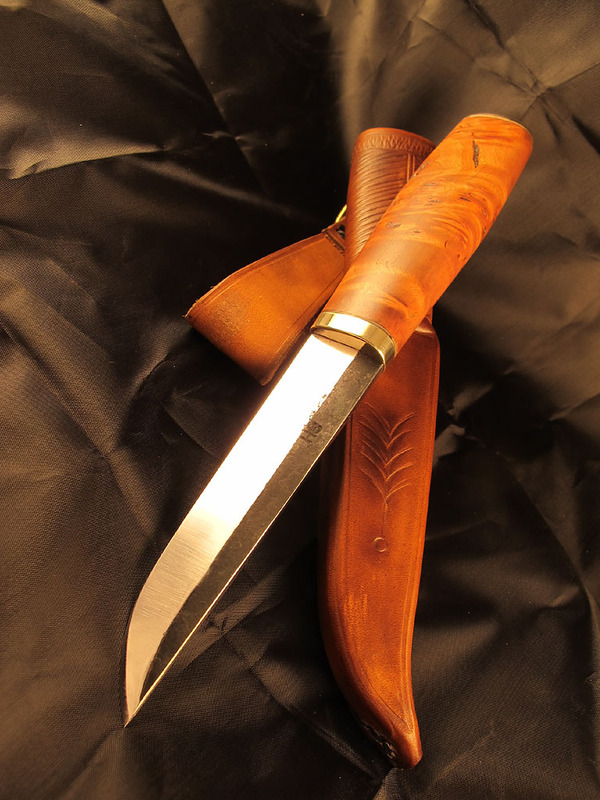 So a puukko and a sheath is always a matching couple. 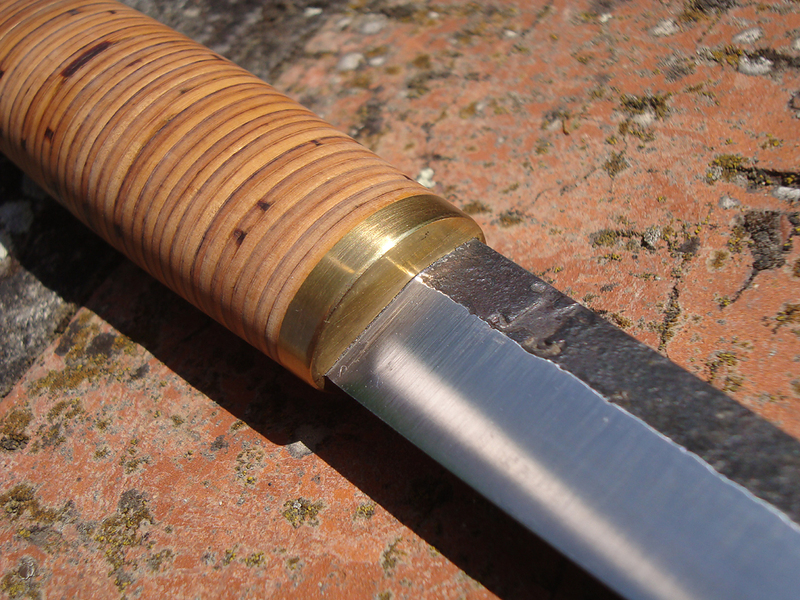 A few months ago my friend Bill wrote to Saku Honkilahti to inquire about a custom made puukko. 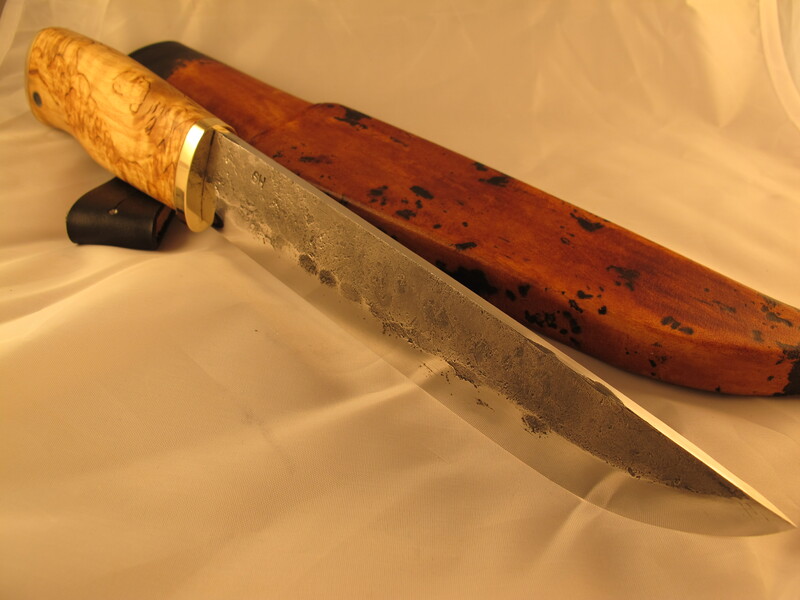 He requested ” a puukko made with a 100mm handle, sallow root if possible(curly birch if no sallow root)and silversteel fittings, 70mm silversteel blade with secondary bevel.” We asked Saku if he would be interested in making a work in progress piece while he was creating this knife. Saku agreed and this post is the result. 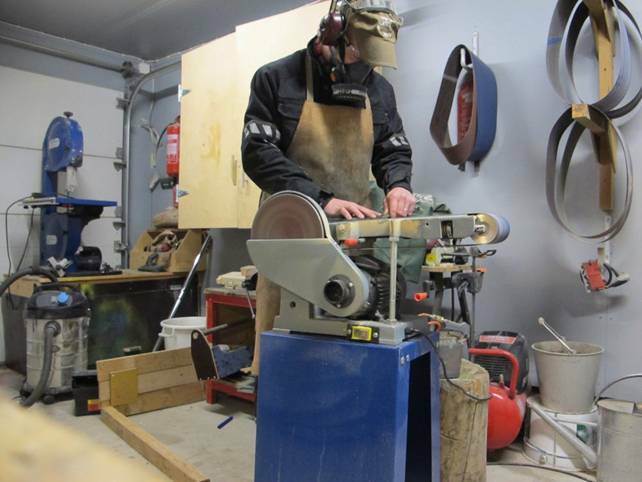 I really like Saku’s puukkos and it’s great to be able to watch him work and follow the progress step by step. 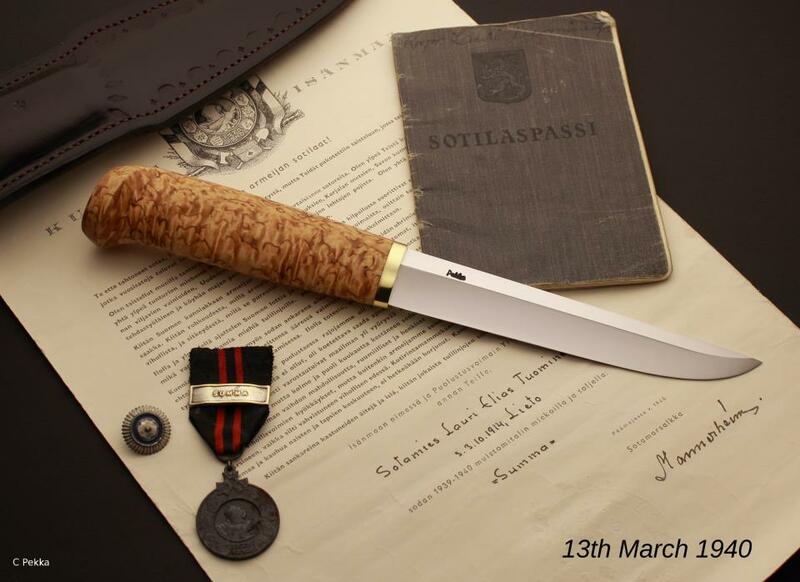 Thank you Saku for doing this project, beautiful work as usual! 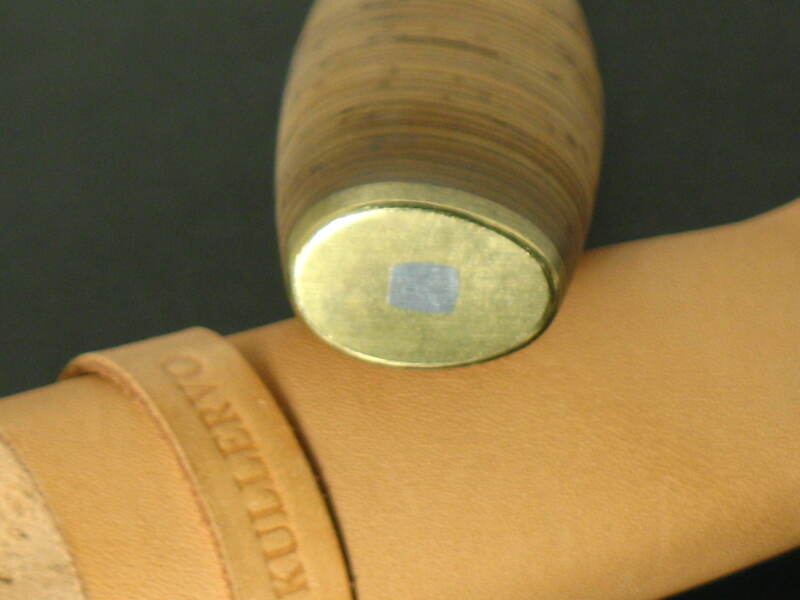 It all begins from 12mm round silver steel stock, named Böhler K510. 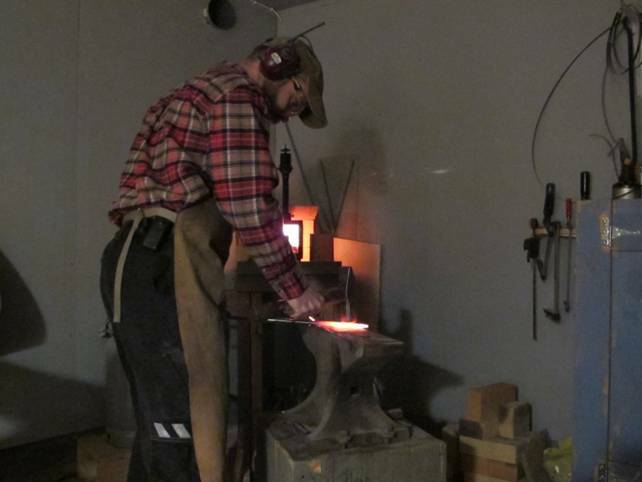 I use a 100 year old anvil, a 50 year old hammer and an almost new gas forge. 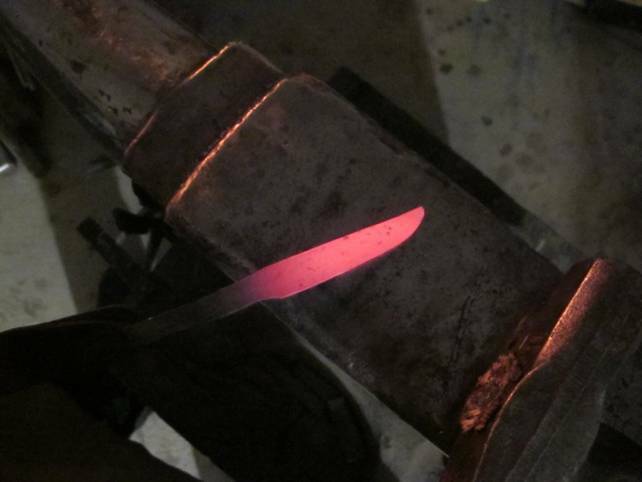 Right temperatures are really important during forging. That’s why I am working almost without lights, I can see colors of the steel, I can almost smell when temperatures are right. 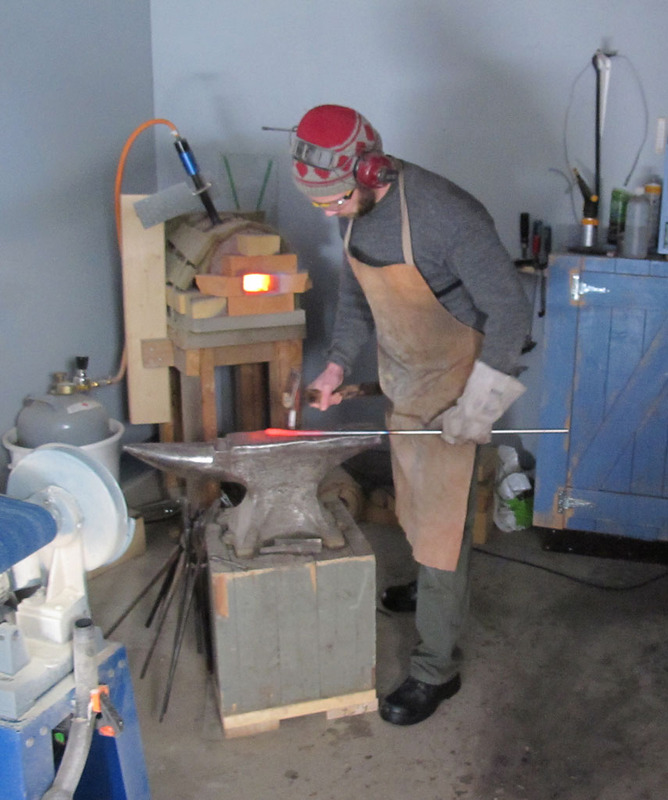 Hammering is a hard job, but it is the only way to get round stock to blade, and I believe that a carefully forged blade is the one and only way to do it. 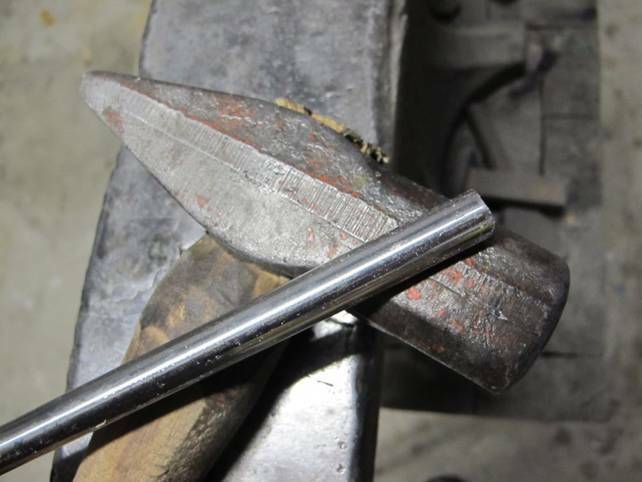 After forging and some heat treatments is it time to use the angle grinder for rough job and the grinder to get the final result. 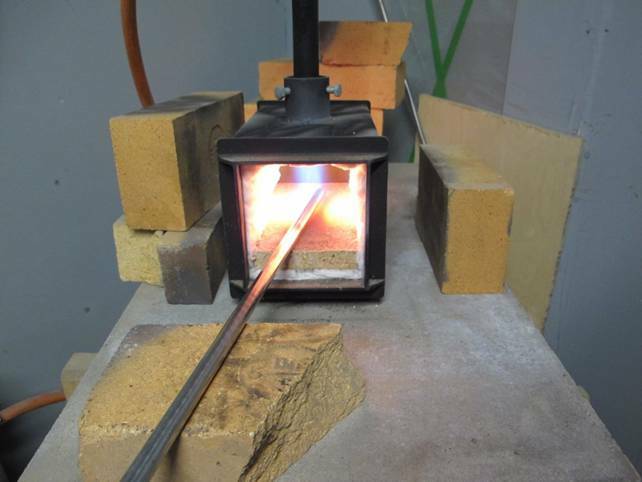 After heat treating it is time to polish the blade. 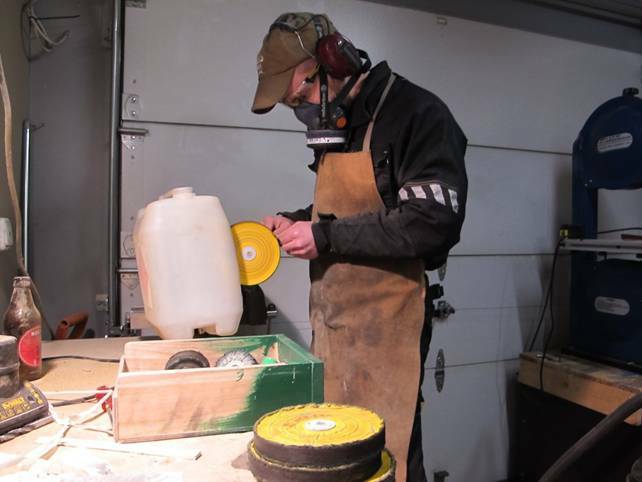 It is almost all done by hand. 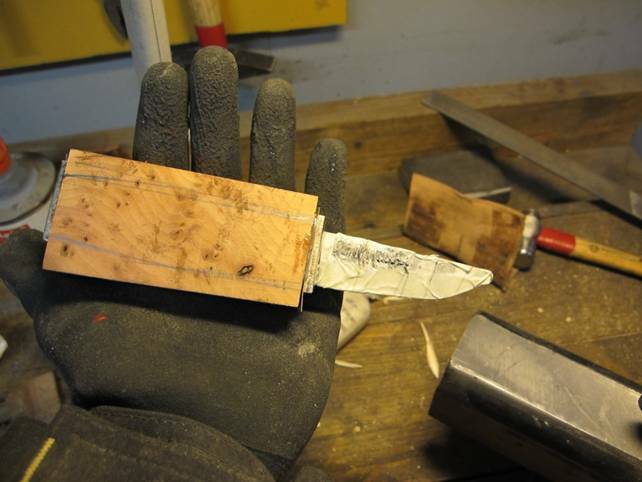 Now the soul of the puukko, the blade is ready. 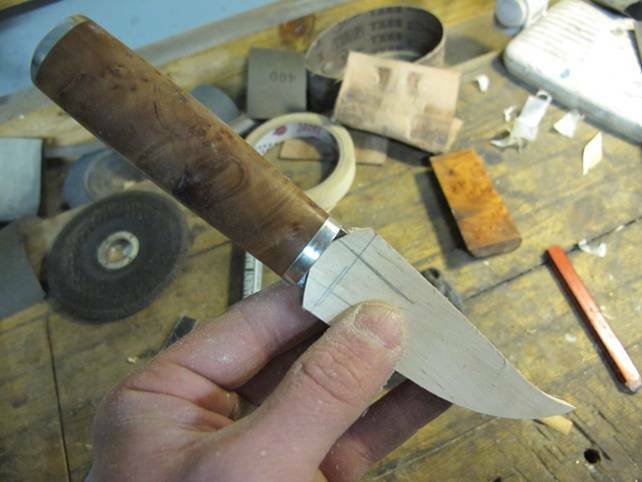 I do some testing routines for every blade I make: brass rod test, whittling birch and paper slicing. 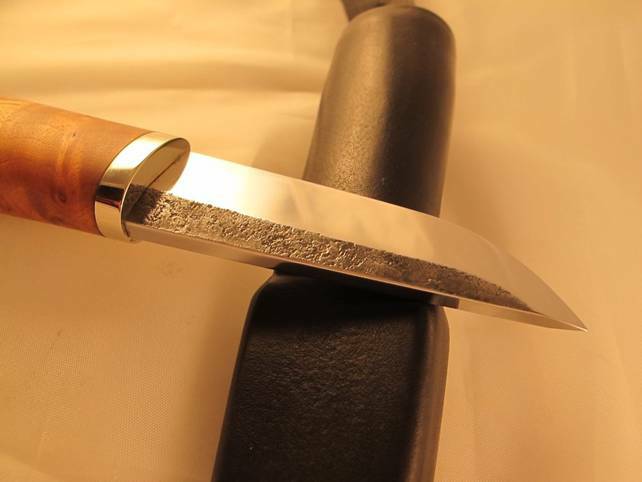 They are not extreme tests, but those tests tell me that the blade works like I want it to. 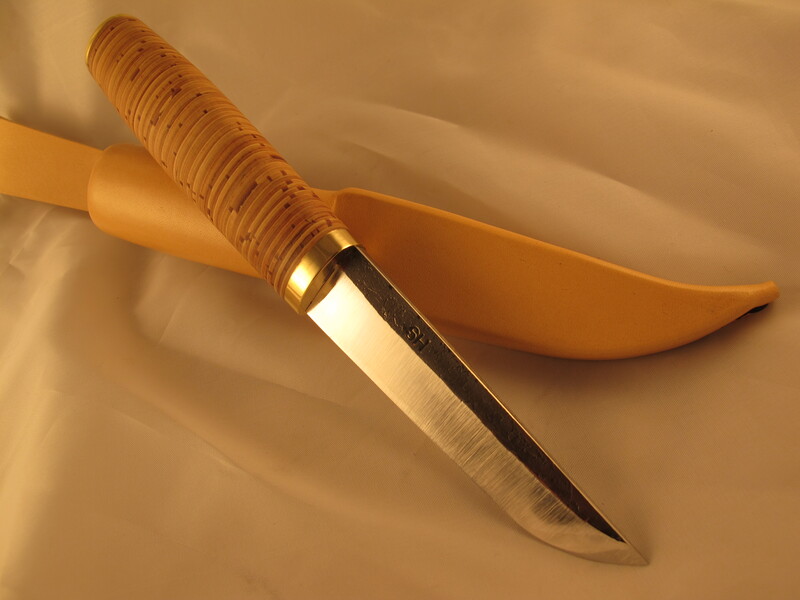 A birch bark handle with brass bolsters is usual for me, but this time it is a little bit different materials: sallow root gnarl and nickel-silver. 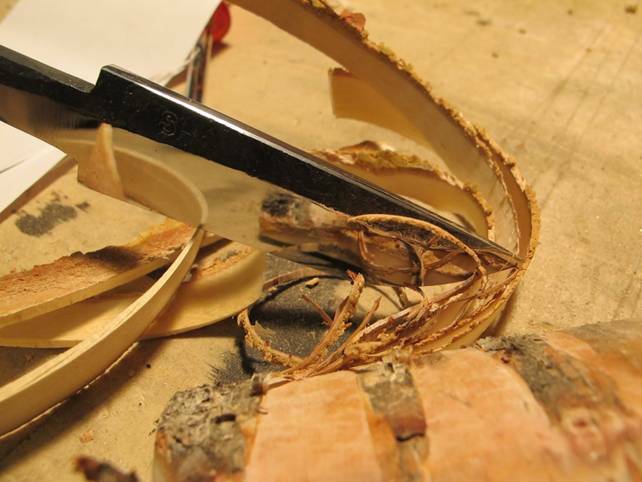 Only very thin slices from birch bark comes between bolster and wooden part. 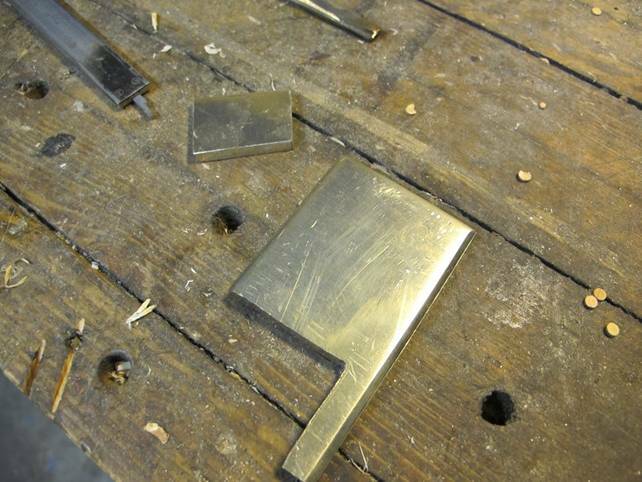 First I must cut some nickel-silver with the hack saw. 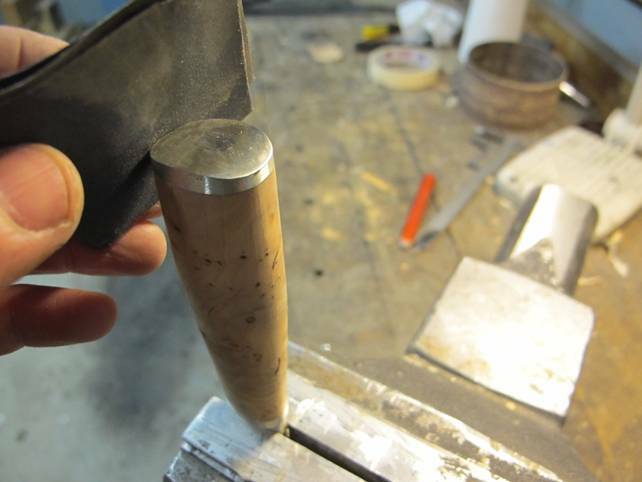 With drill and needle files I do the hole for the tang. 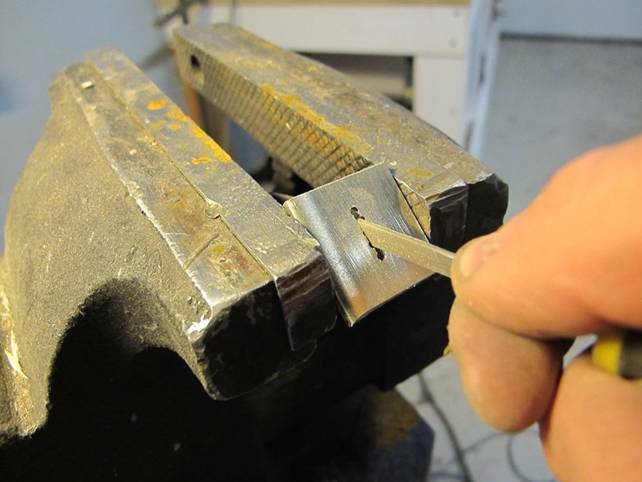 This is a tricky job, because of the blade geometry. It takes time and many adaptations. 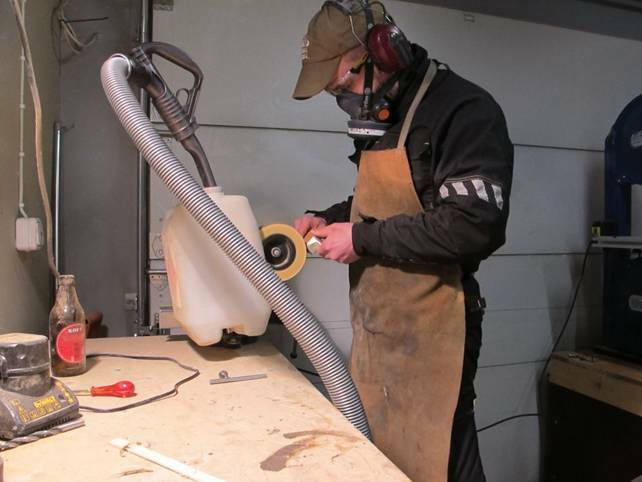 The face of the front bolster gets final polishing when it sits nice and evenly in its place. 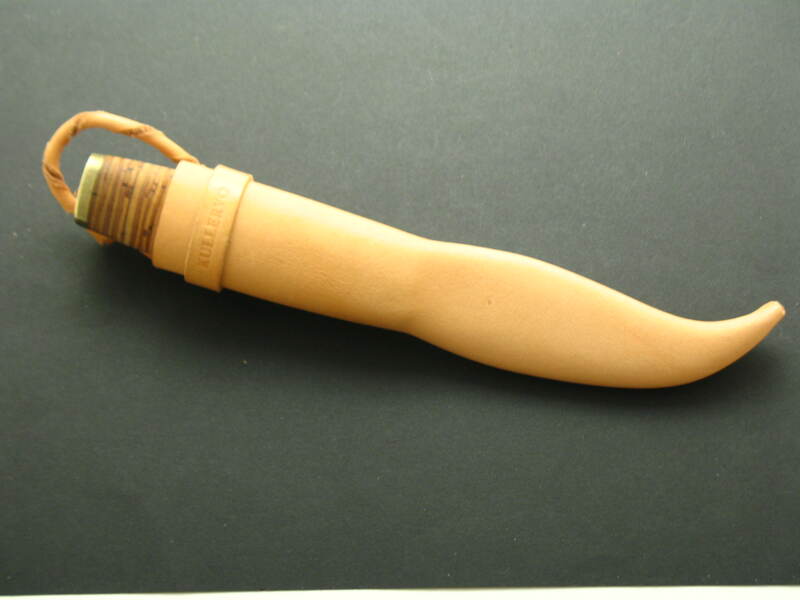 Back bolster comes next, then the wooden part. 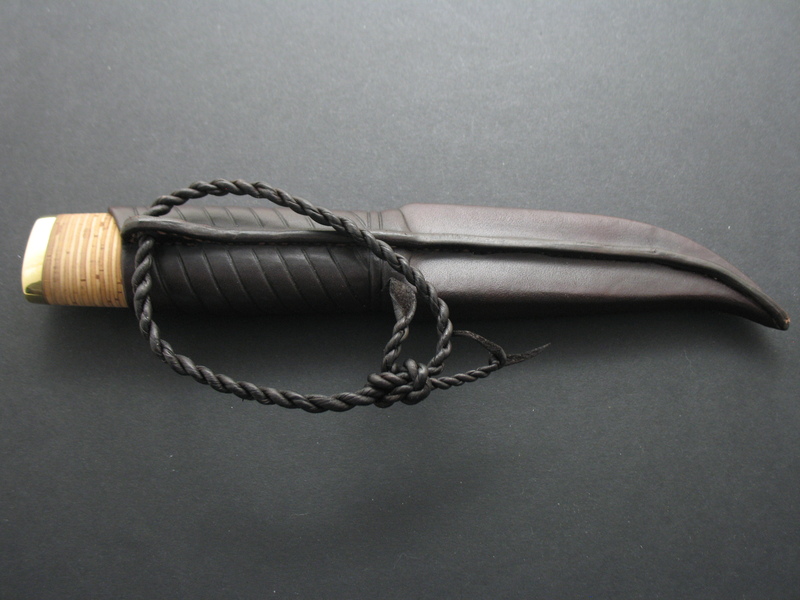 Again, with drills and needle files, the tang get its place. 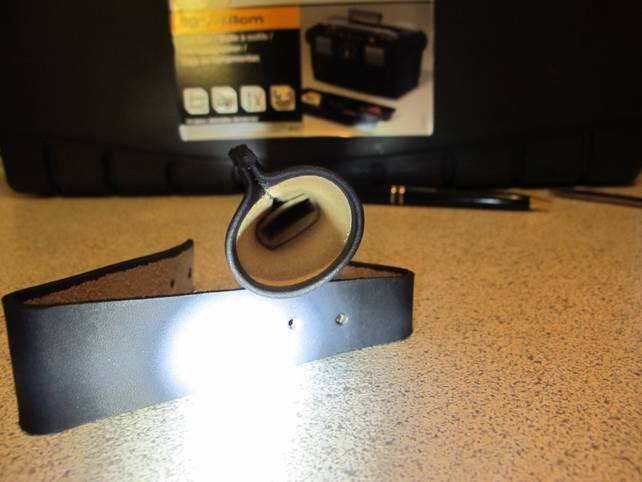 This is also time consuming and an important part. 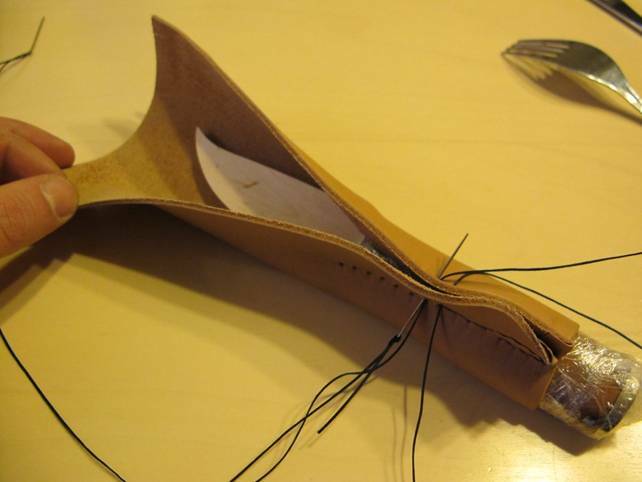 Of course, I use glue and peening, but if I want really solid construction, also this adaptation must be careful. 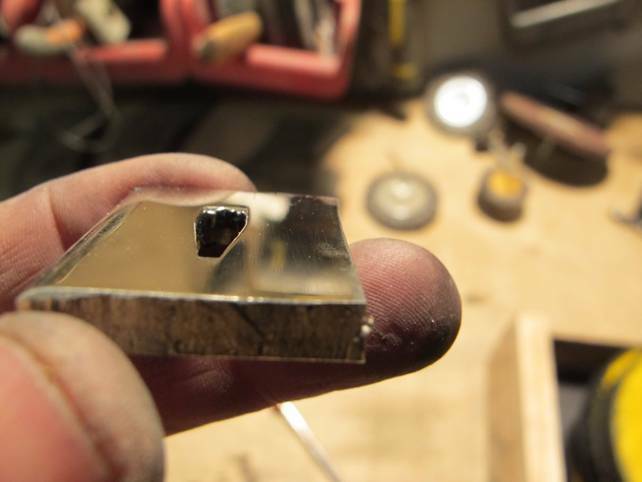 When all fits nice and easy, it is time to clean all surfaces with acetone to be sure that the epoxy glue gets a tight hold. 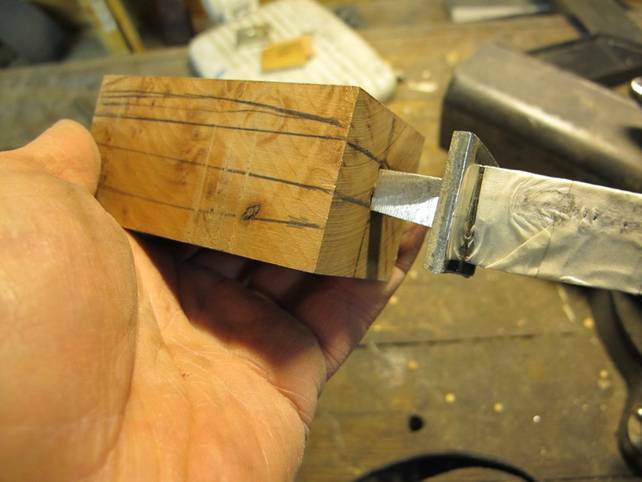 I don’t use presses or other aids, I trust for the peenings power to get all surfaces together. 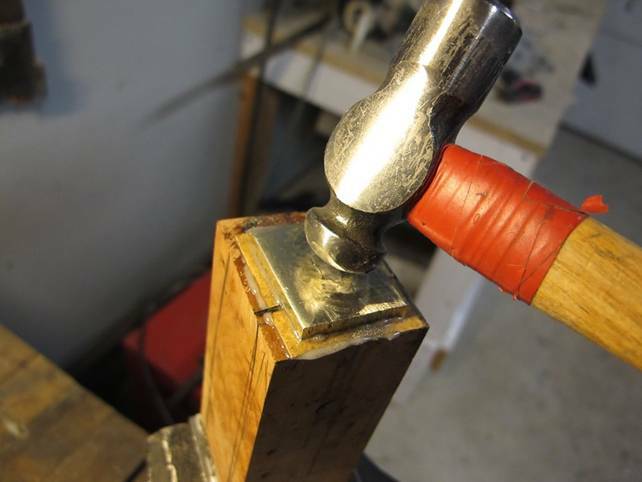 When the epoxy is hard, it is time to shape the handle. 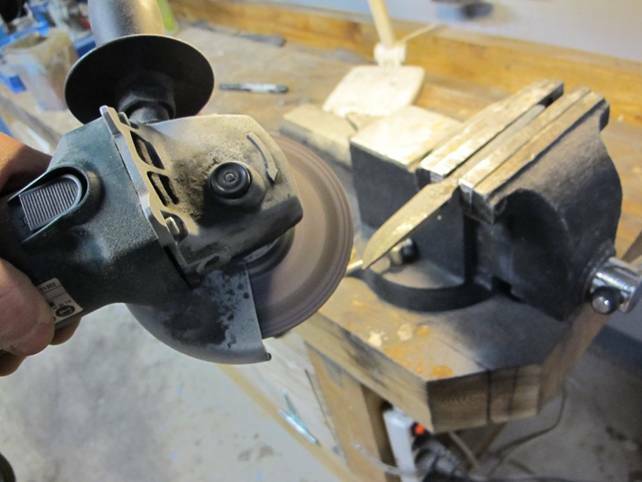 I use same old electric drill and round sanding wheel with very rough grade paper. 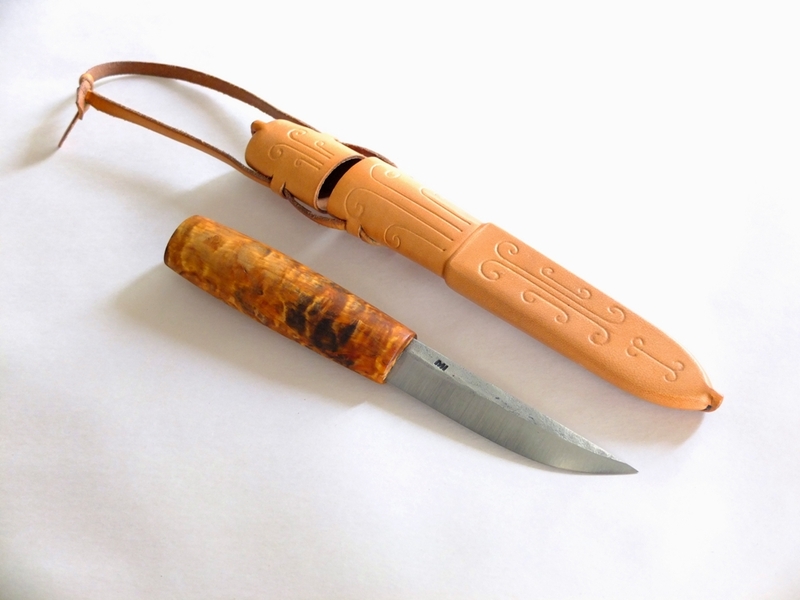 Basically, puukkos handle shape is very simple. 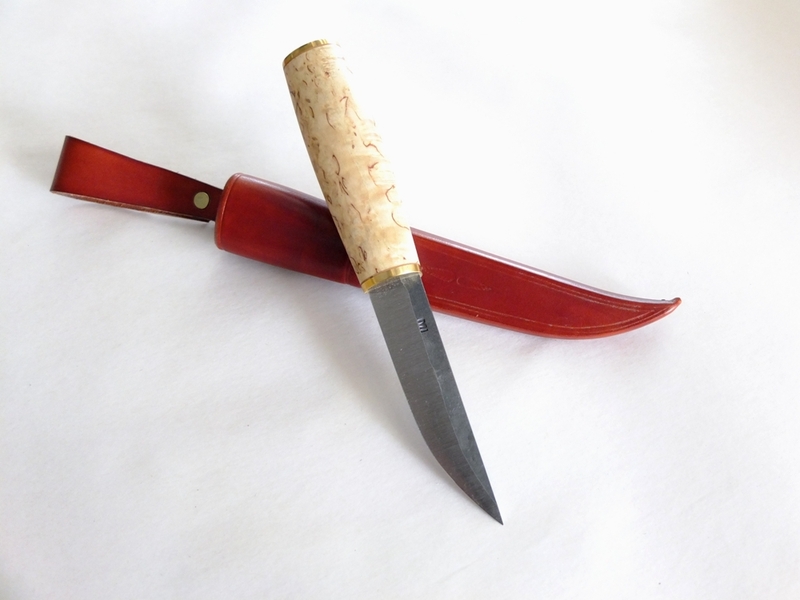 But still, this operation needs finesse and steady mind, because puukko is really born in this stage. 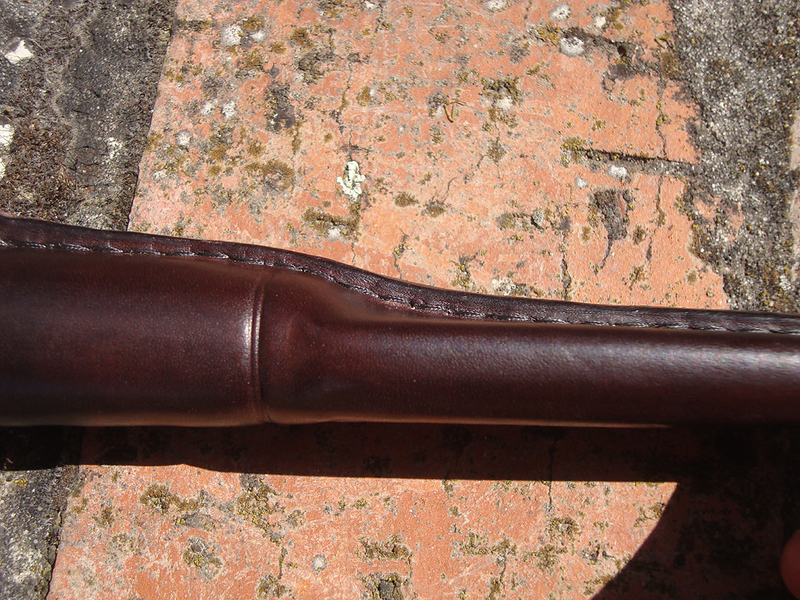 And of course, the final results comes with elbow-grease. 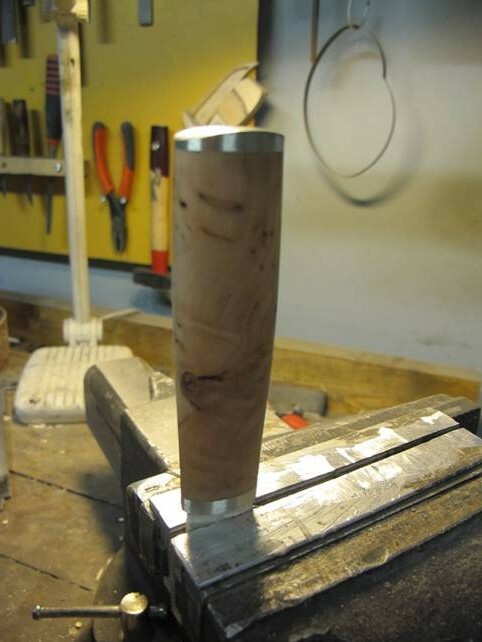 Now the bolsters need polishing and the wood needs some oil and polishing. 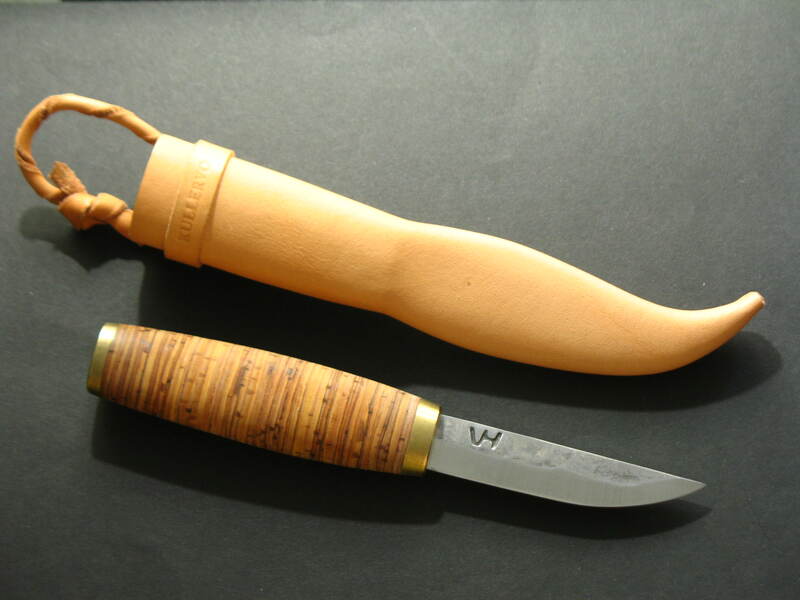 The wooden insert, the lesta, is an important part of the sheath, so sheath making starts in the wood pile. 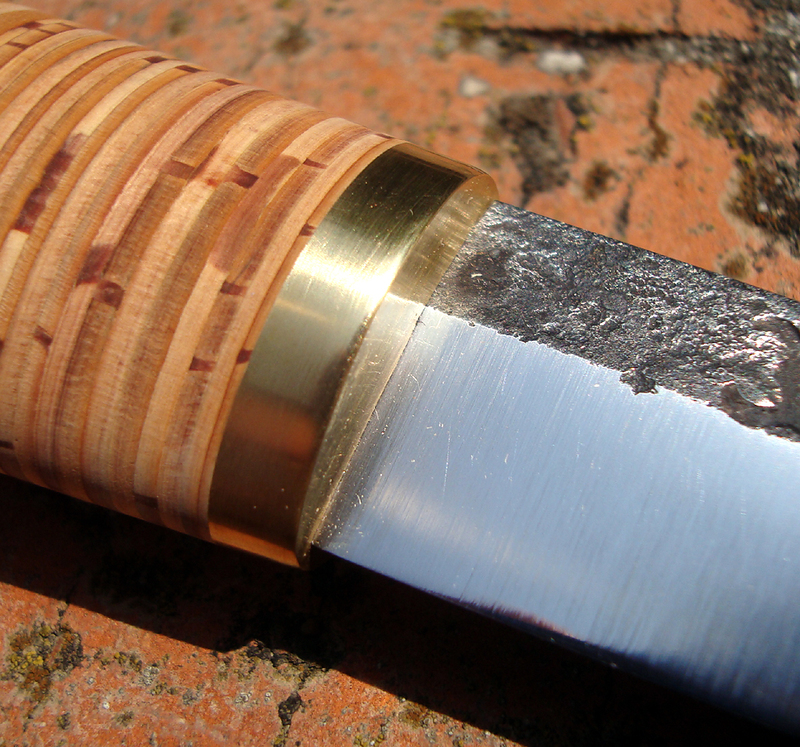 I prefer birch as it is homogenous and relatively easy to work but still hard and reliable. 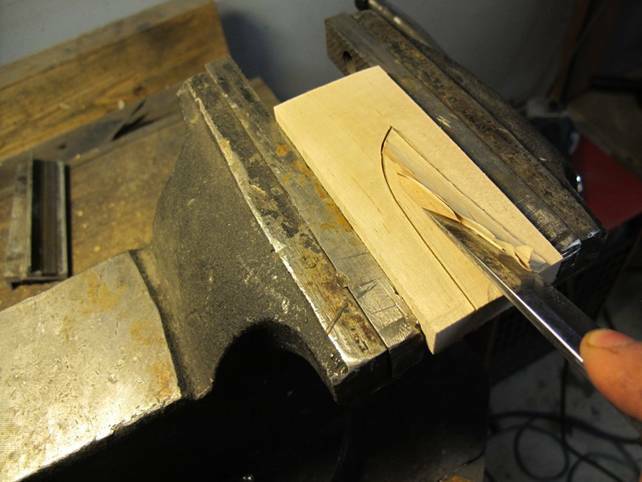 I draw blade lines and carve a place in the wood for the blade. 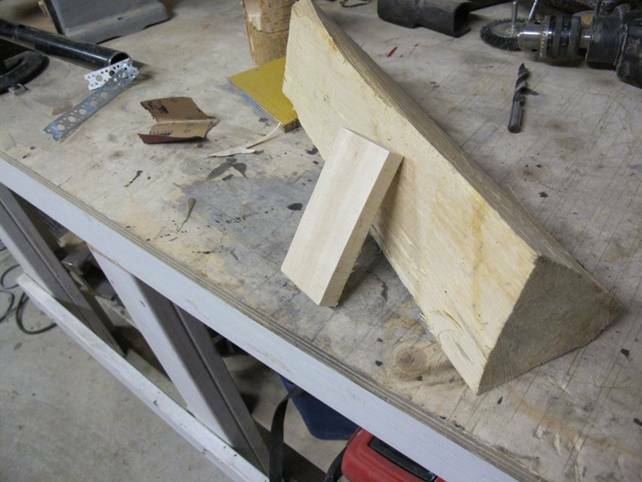 Then I shape it with band saw and sander. 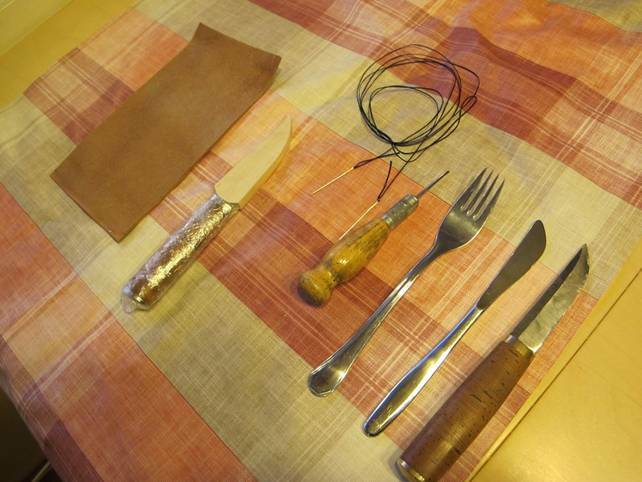 And here you can see all essentials for sheath sewing. 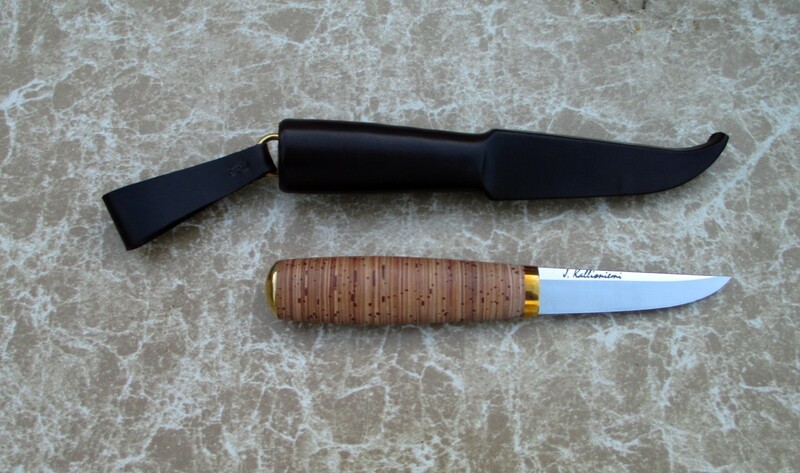 The fork is for marking the holes and the knife is to smooth out the leather. 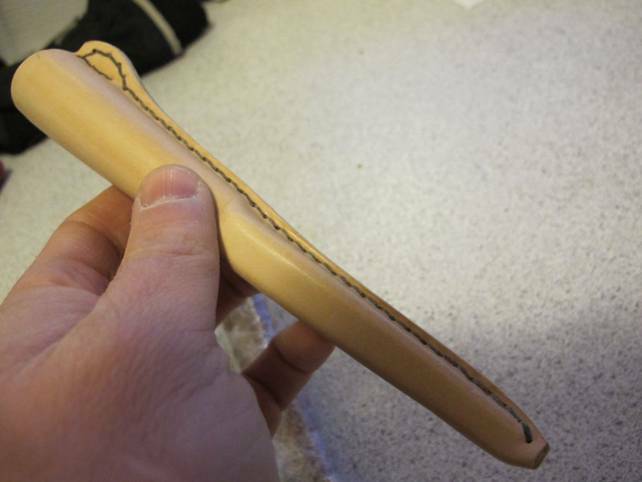 Sewing is done with wet leather, so when the leather dries, the puukko fits perfectly in the sheath. 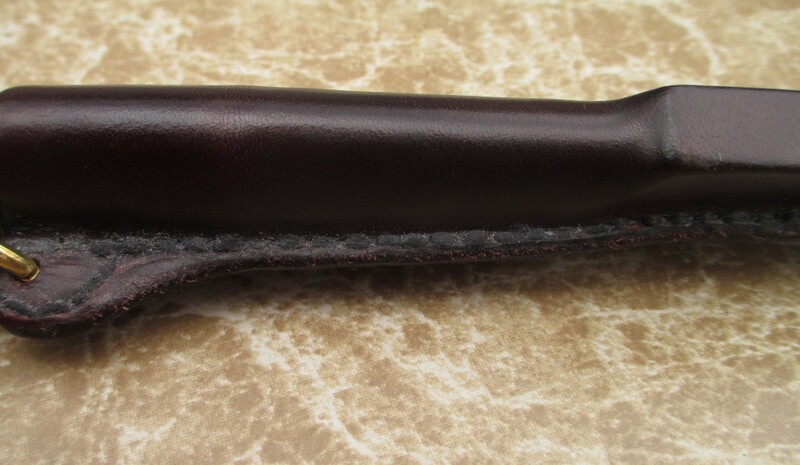 When sewing is done, I cut the excess leather off, with my puukko, of course. 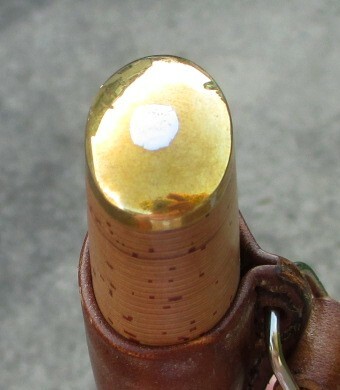 And when the leather is dry, it looks like this. 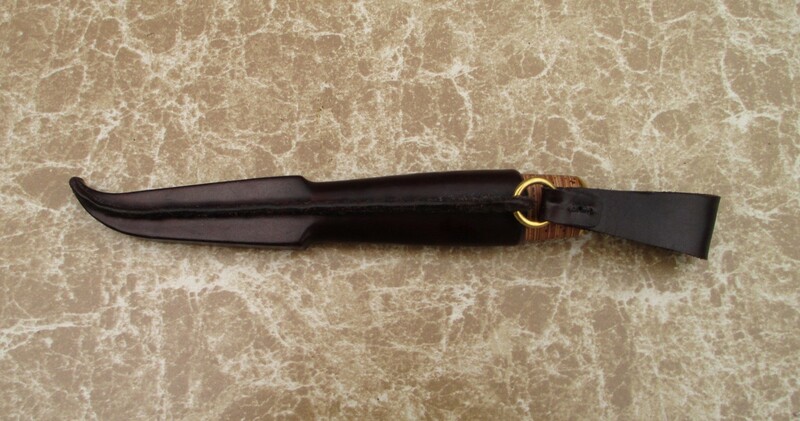 The secure belt loop is essential. 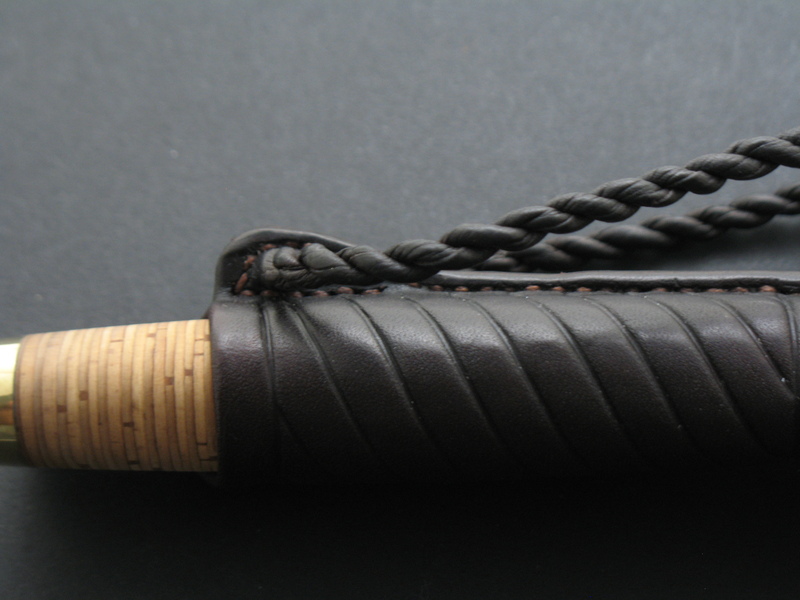 I dyed the sheath with black color. 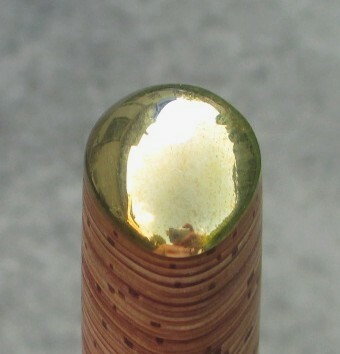 This picture is not so nice at all, but you can see how it looks inside. 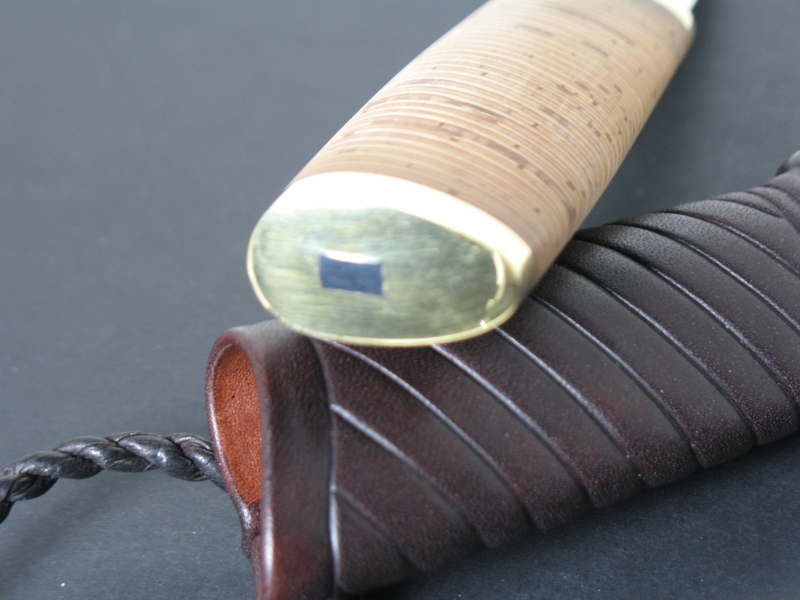 Notice the wooden insert, which protects both the puukko and the puukko user. 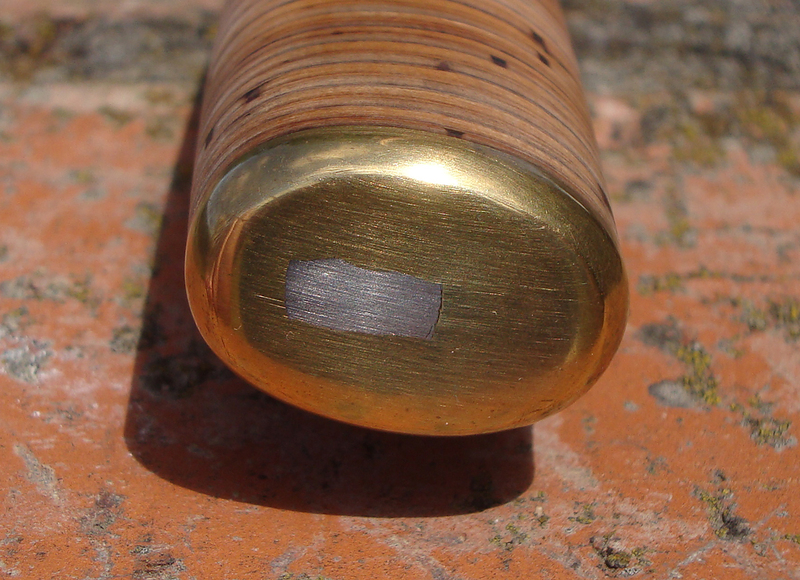 And after some final greasing, refinement and polishing it all looks like this. 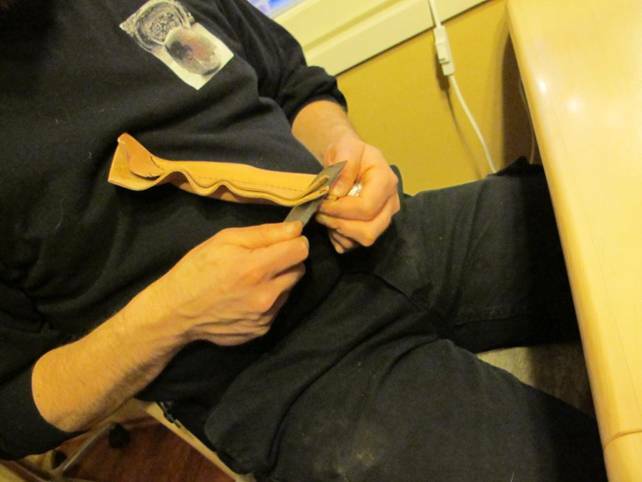 As you can see, hand made puukko making includes many different work phases. It is time consuming but also very satisfying. 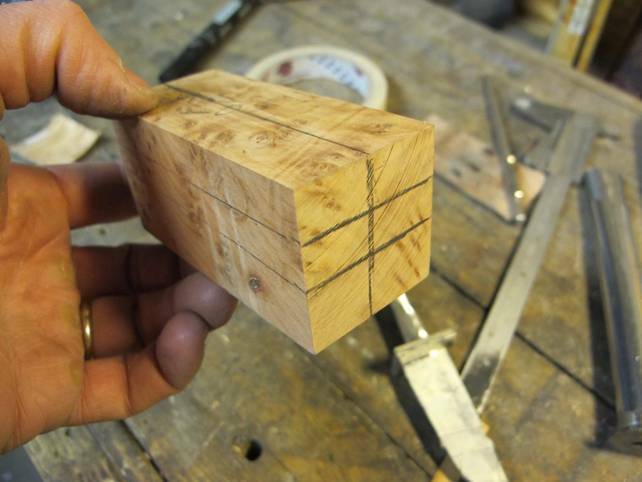 No need for high tech or complicated machines, it is all in my fingertips. ”Everything should be made as simple as possible, but not simpler.” is one of my favorite pieces of wisdom. 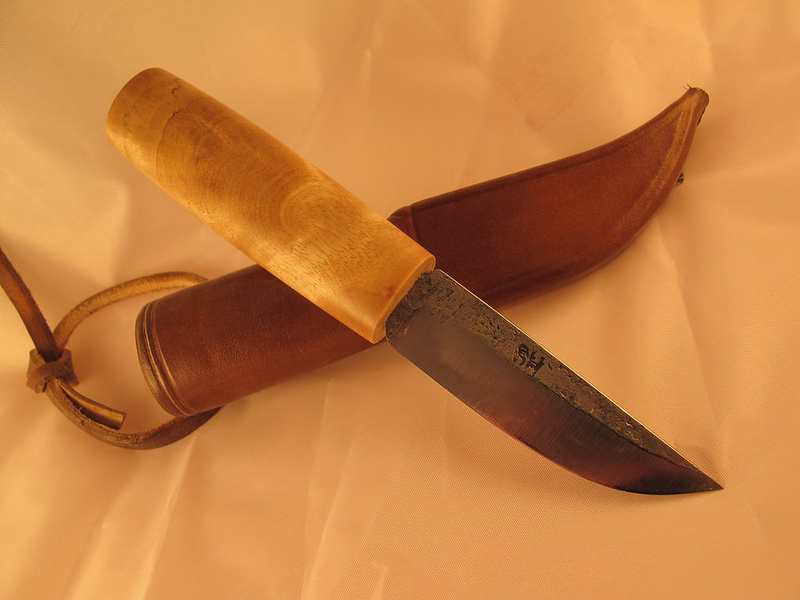 The first puukko I ever owned was an Iisakki Järvenpää Aito which has a stacked birch bark handle. 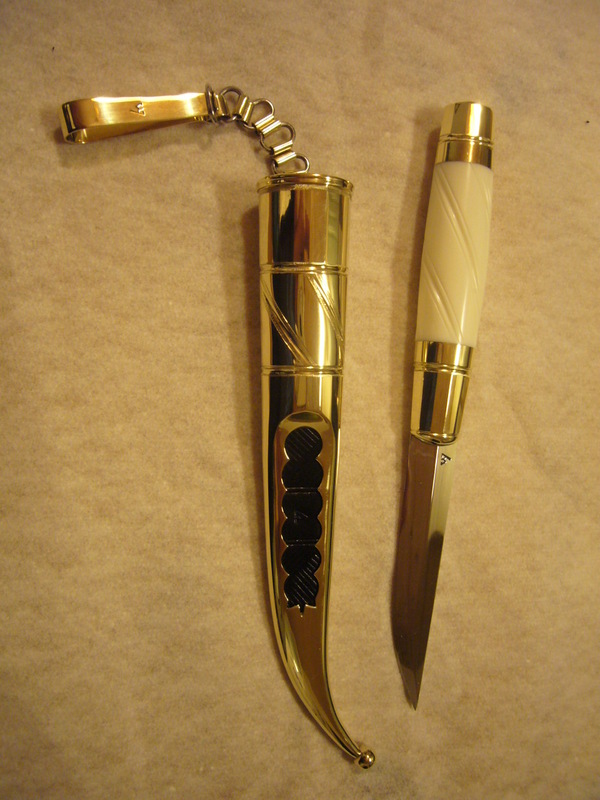 It was given to me as a gift and I was taken with it. 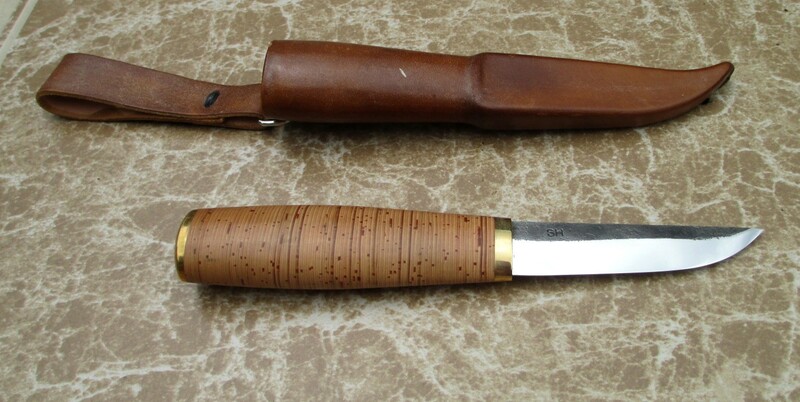 I’d never seen a puukko before and I thought it was just about the perfect knife and the perfect design. 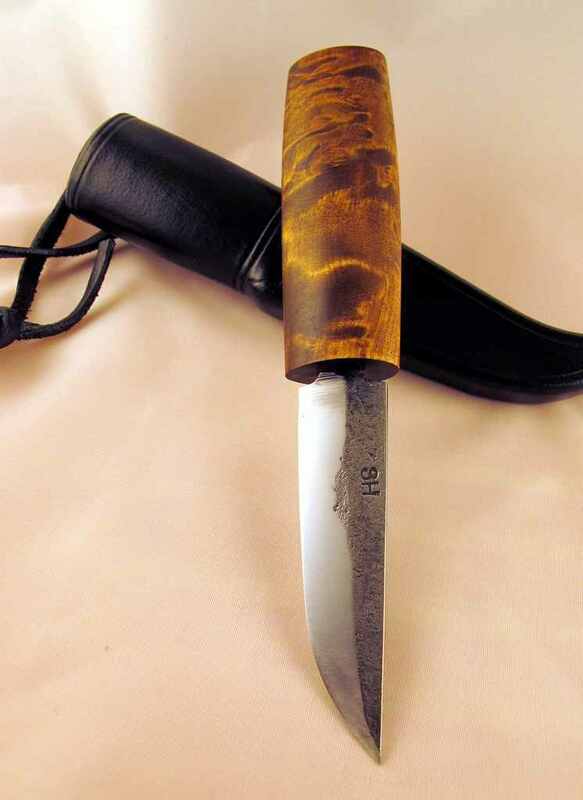 I was especially impressed with the birch bark handle, reminiscent of some stacked leather handled American hunting knives. 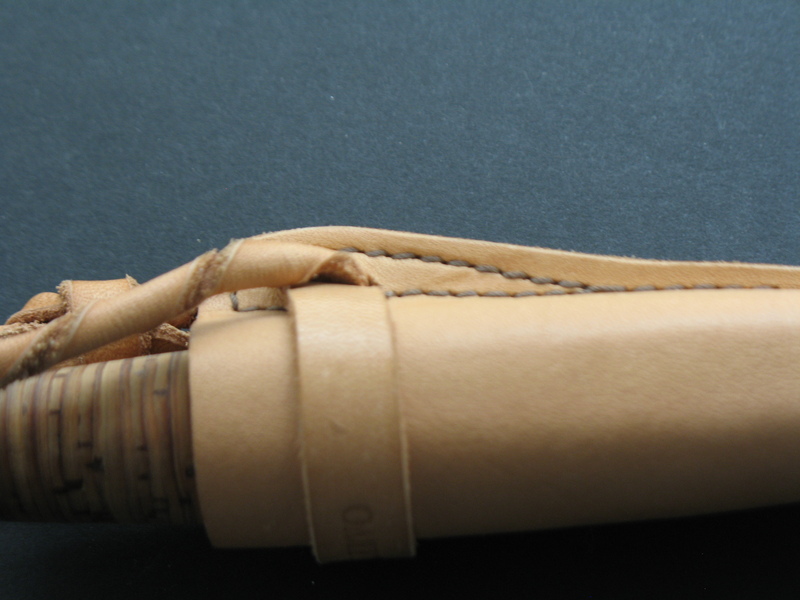 Except the birch bark was nicer, it had a soft velvety warm feel and was easy to grip. 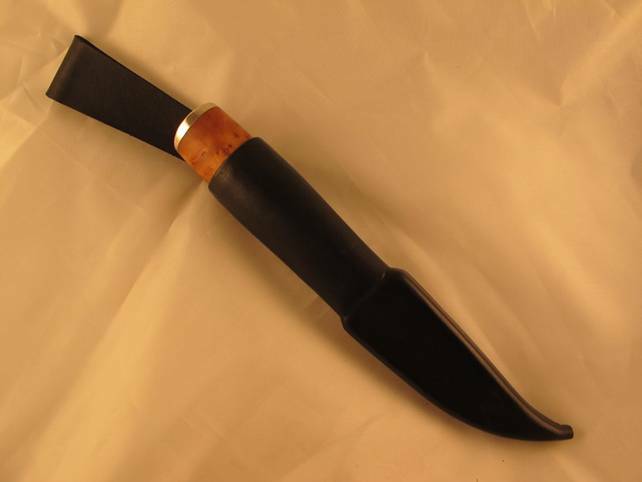 The knife was a pleasure to handle. 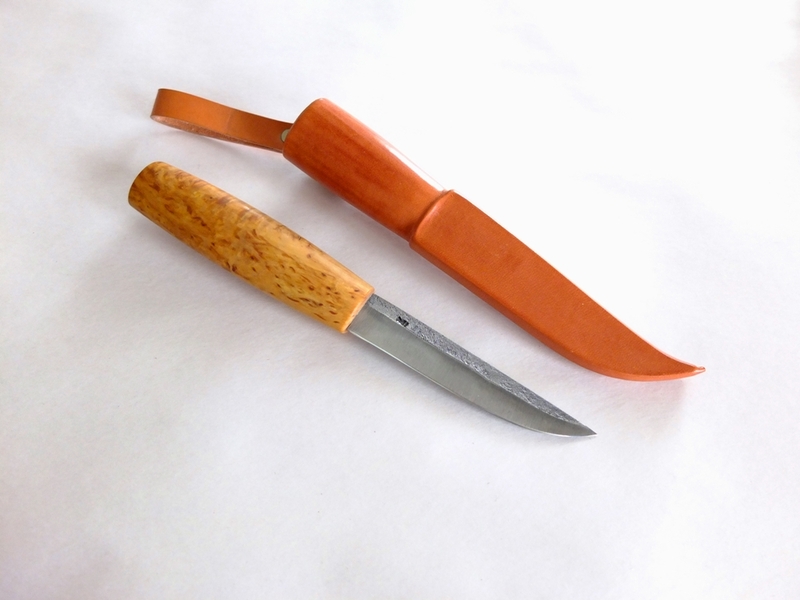 I found that the use of birch bark is traditional in Finland, and it’s used on several styles of puukkos and is very popular. 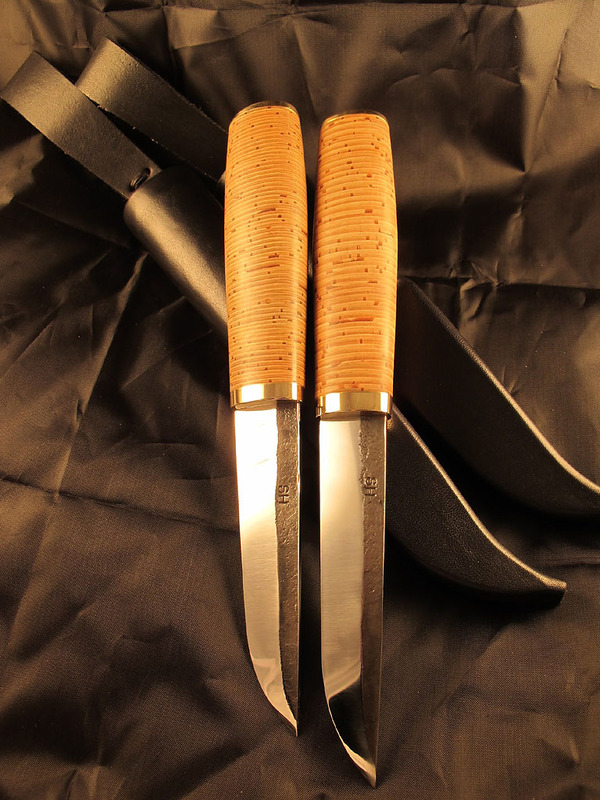 As I got to know some puukkoseppä through this blog I was able to learn how these puukkos are made and post some tutorials of how it’s done. 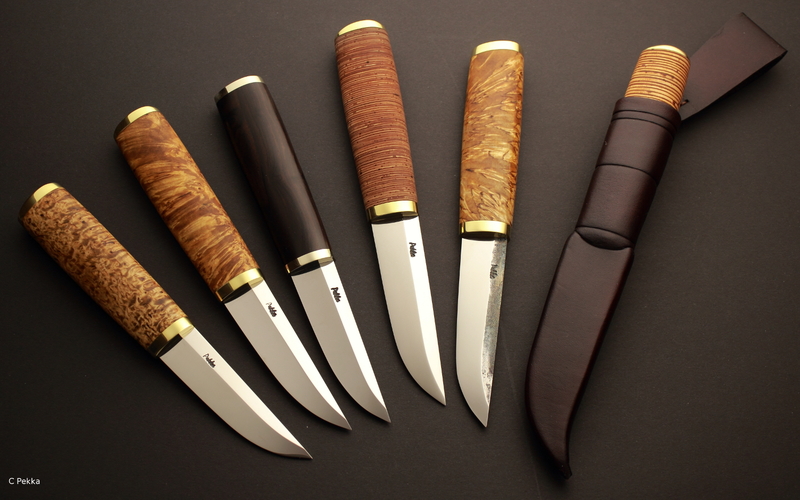 This post is simply to show some very nice puukkos with stacked birch, an appreciation of the form. 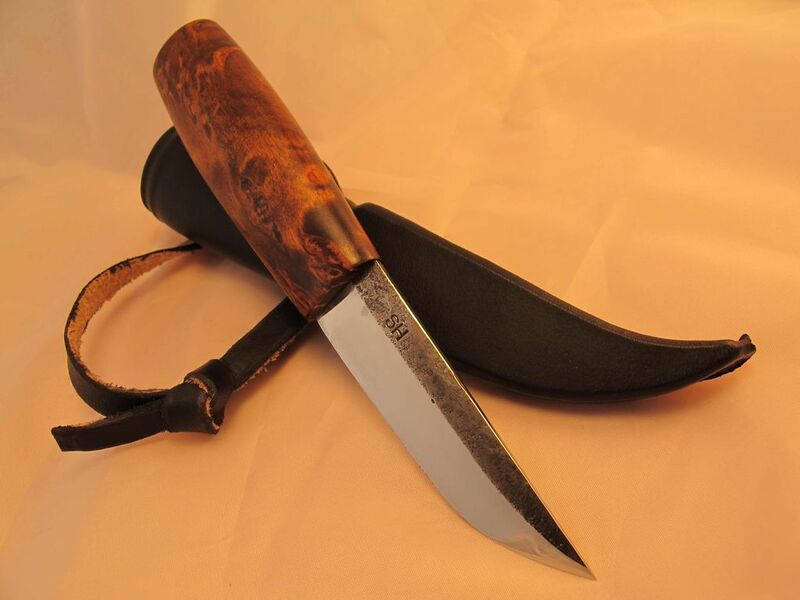 The ones featured belong to my friends Bill Lecuyer (who started me off with the gift of that Järvenpää Aito) and Federico Buldrini who has written several features for this website. 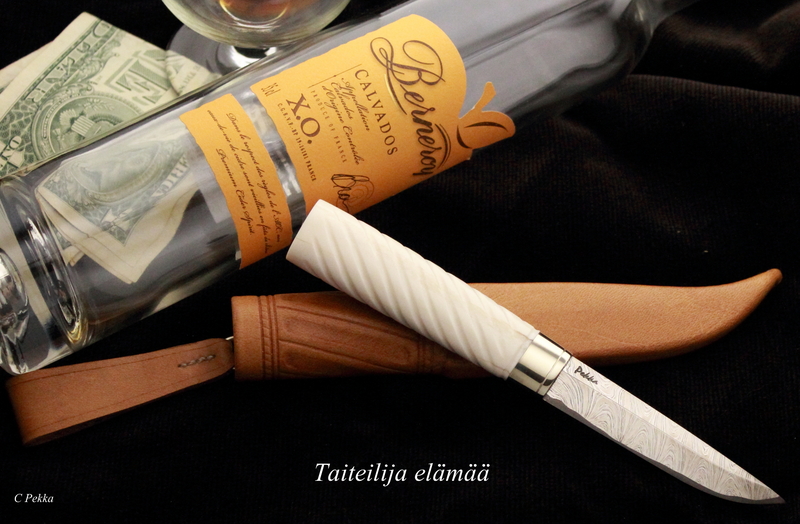 Thank you to Bill, Federico and the talented puukkoseppä for making them! 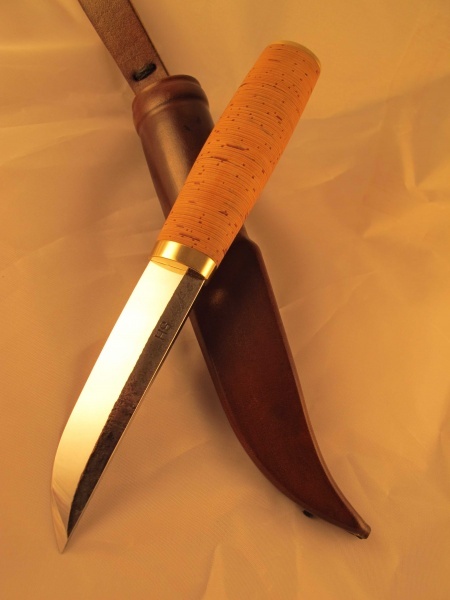 Look at Index Page to learn more about these knives and how they are made. 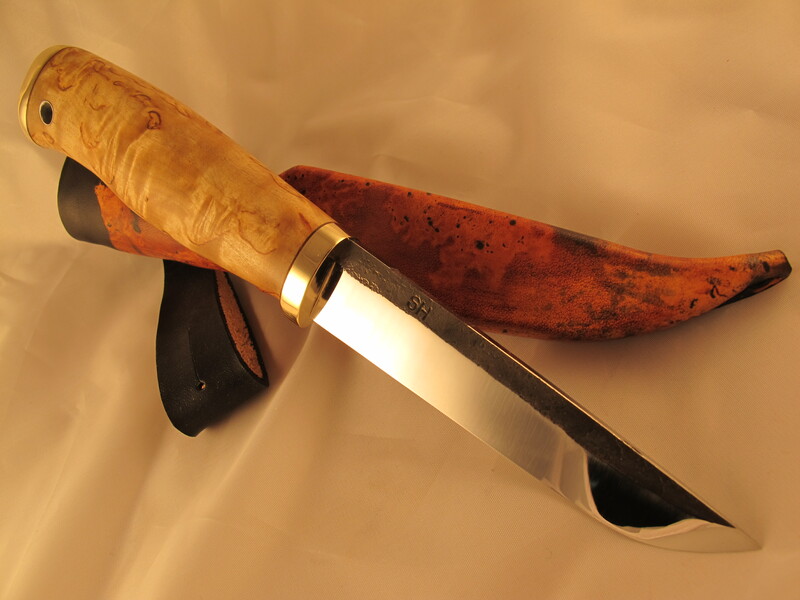 Kullervo puukko by Veikko Hakkarainen of Tapio, Rovaniemi. 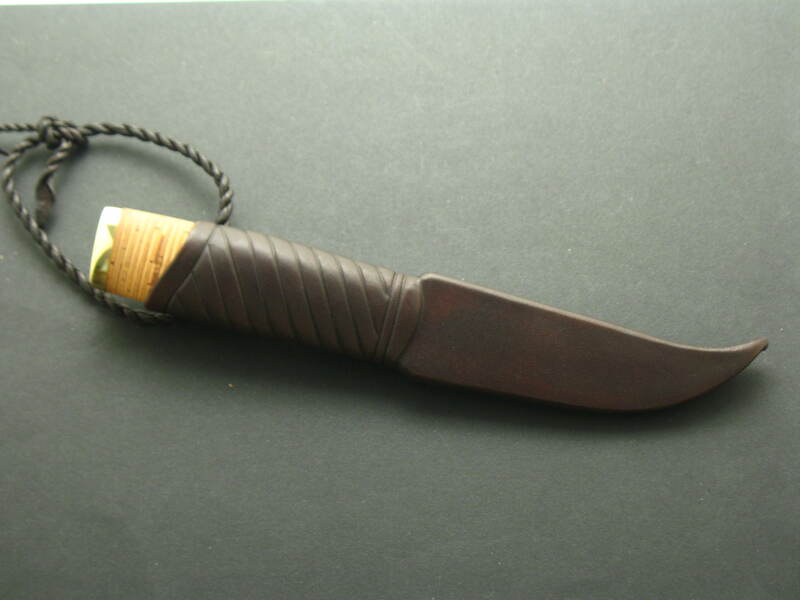 Blade length 85mm, handle length 110 mm. 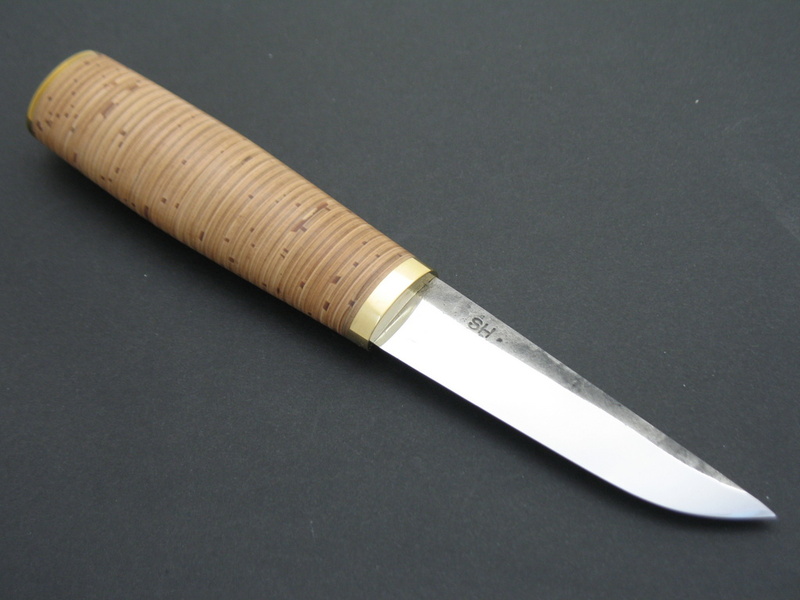 handle 110 mm, tang at peening: 10×4.5 mm. 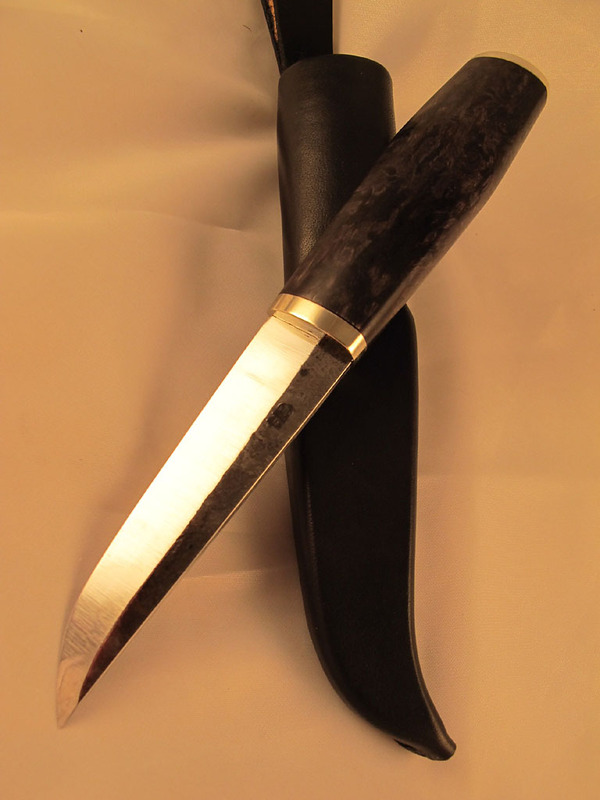 Another one by Pasi Hurttila, 100x22x5.6 mm blade, 110 mm handle, 9×5 mm tang at peening. 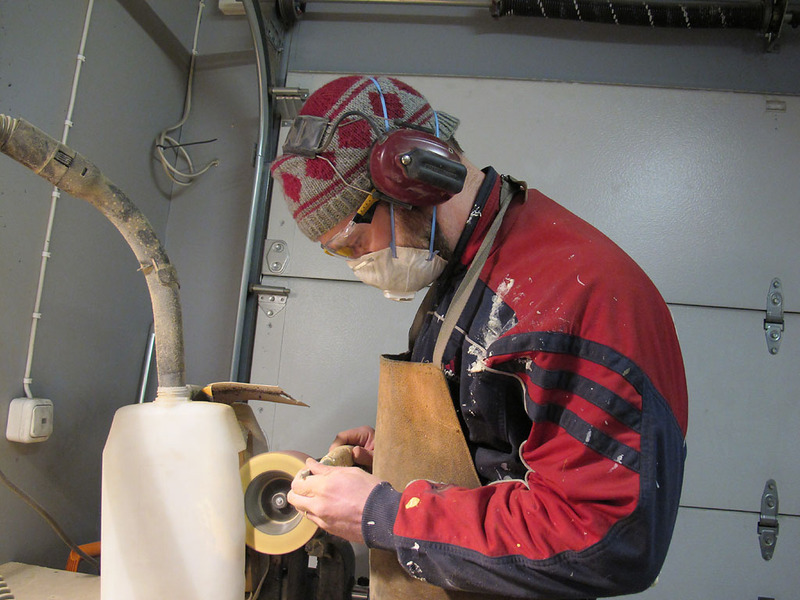 Joonas Kallioniemi puukko. 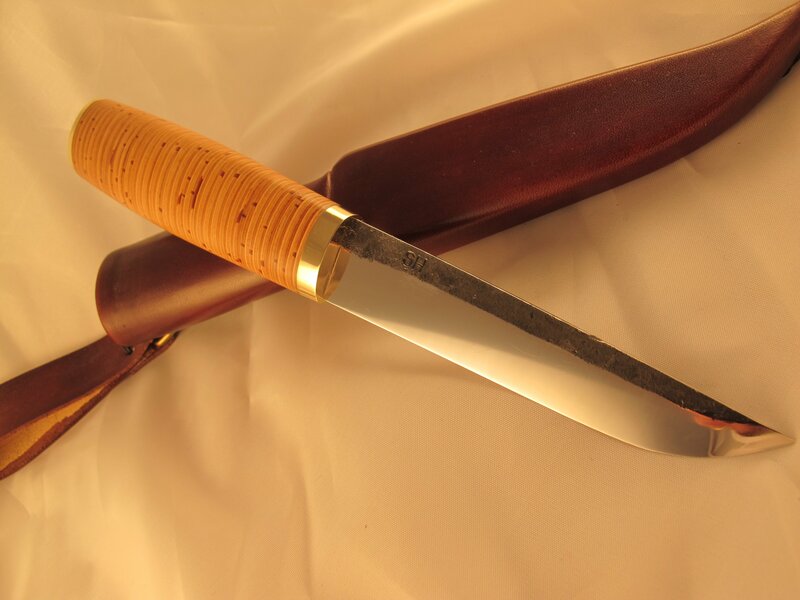 Blade 95 mm, handle 105 mm. 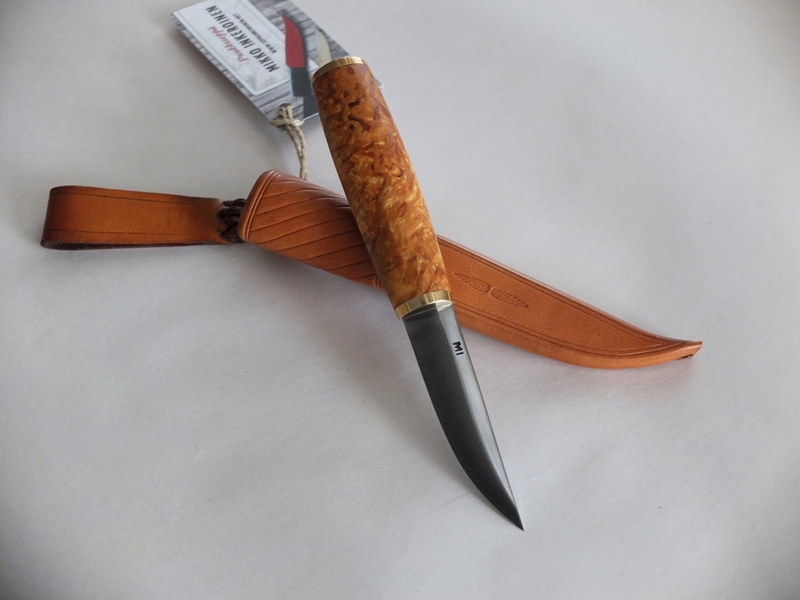 Puukko by Saku Honkilahti. 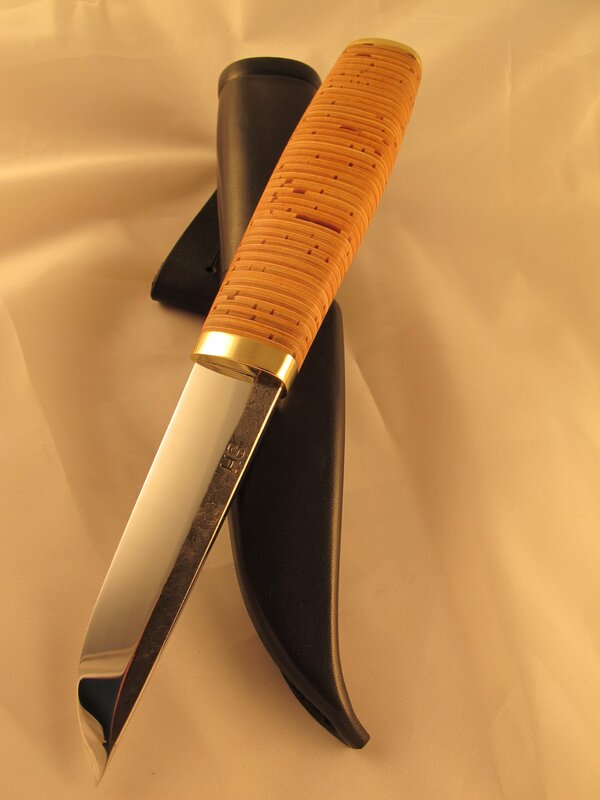 Blade 90 mm, handle 105 mm.